Havana. It's a bit like the forbidden fruit in the Garden of Eden. Does it taste better because it's forbidden or is it naturally sweet? Few cities are defined by the architecture and natural beauty of its residential and commercial buildings. There's Paris. There's Buenos Aires. Add Havana to the list. 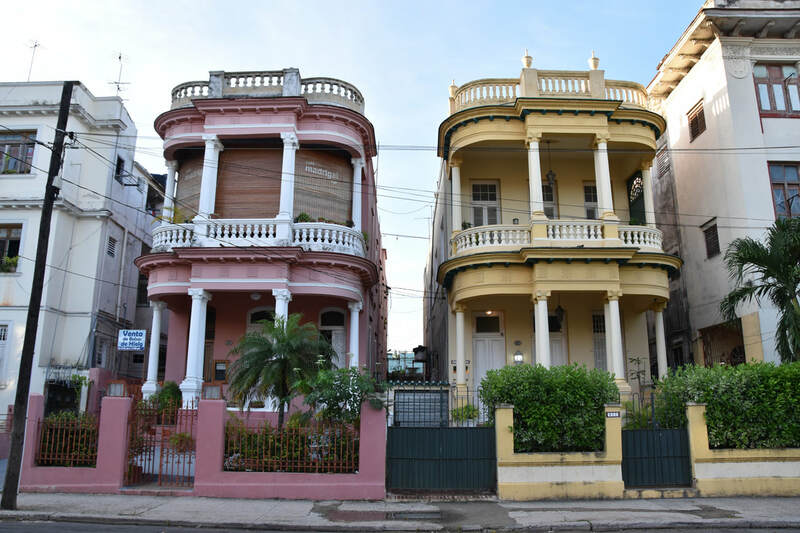 Between the two, Havana is similar to Buenos Aires in that the city went through a boom period and nearly every building was grandly and ornately designed. 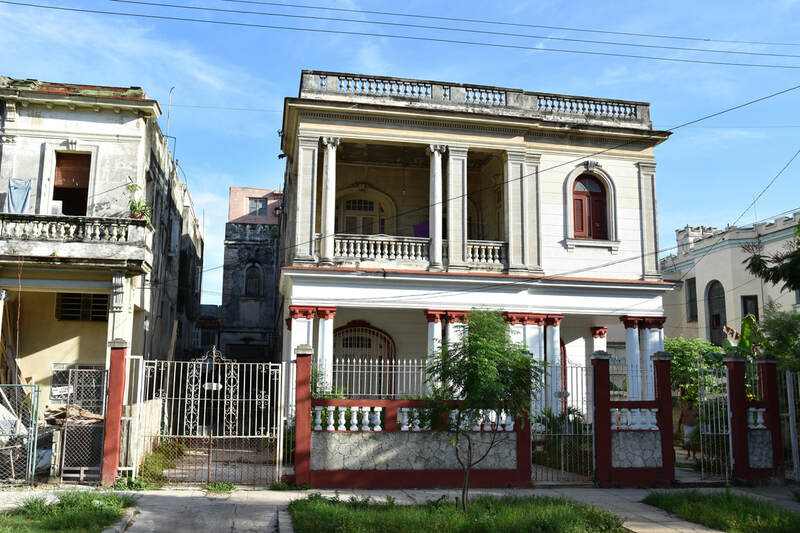 Havana went through two boom periods - its Spanish inspired old town and its Spanish / Classical revival fusion in the new town, predominantly the neighborhood of Vedado. 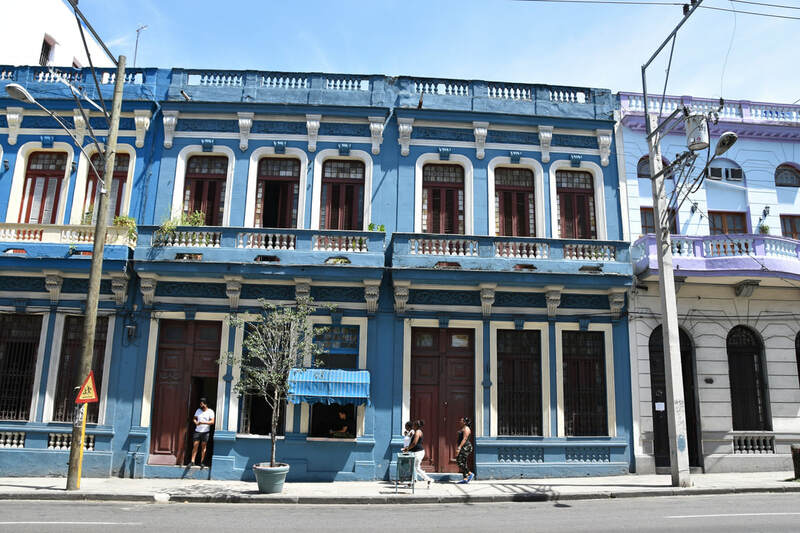 Also similar to Buenos Aires, Havana has dropped, significantly, from its peak and just like Buenos Aires, the aging and deterioration of those beautiful buildings has only made them more beautiful (at least from a traveler's perspective). We landed at 7:30 at night. No issues with arrival. No issues with immigration. No checked bags. 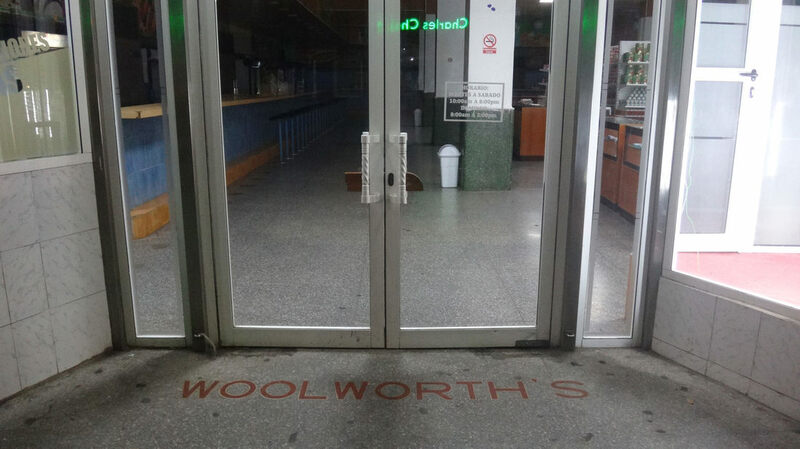 No line at the currency exchange. We were searching for our taxi ten minutes after departing the plane. 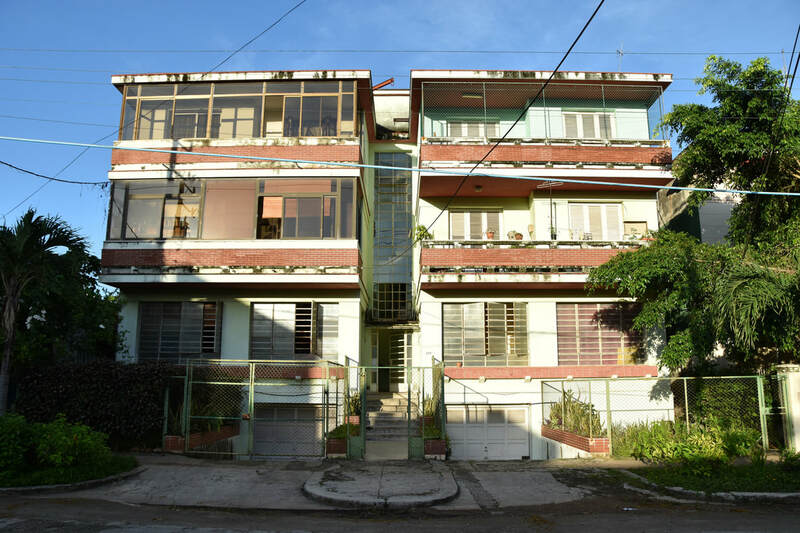 No traffic to the Airbnb in Vedado. A seamless arrival. 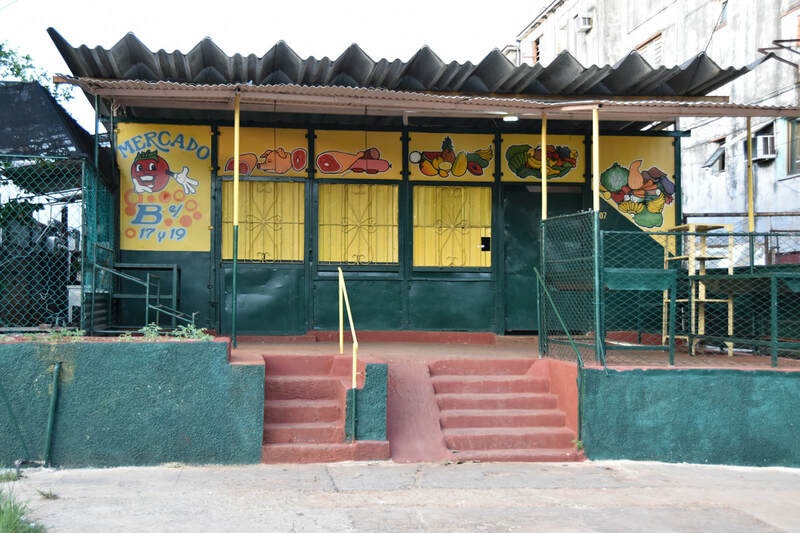 When researching places to eat and things to do in Havana there's the 1A option of El Cocinero and the 1B option of La Fabrica de Arte. 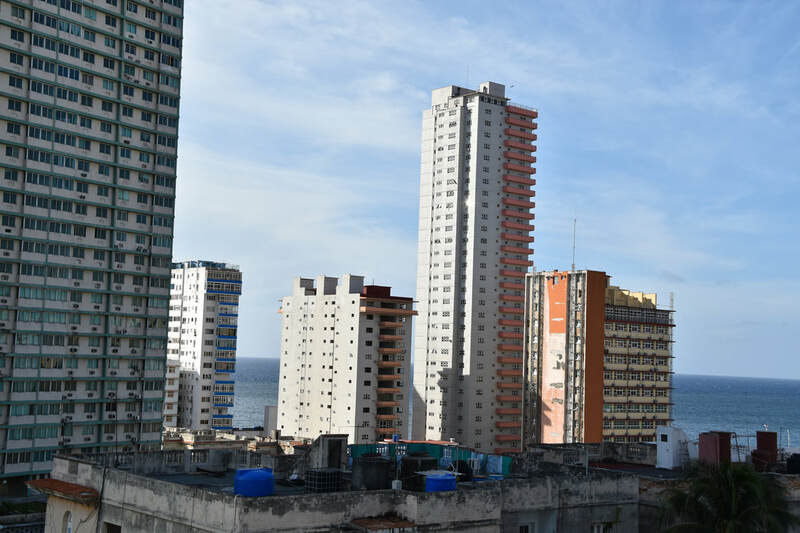 Fortunately the 1A and 1B options are directly next door to one another so it makes for the perfect starting combination for all things cool in Havana. From our AirBnB it was a thirty minute walk along Calle 23. Calle 23 being a major thoroughfare, we passed glorious after glorious building. 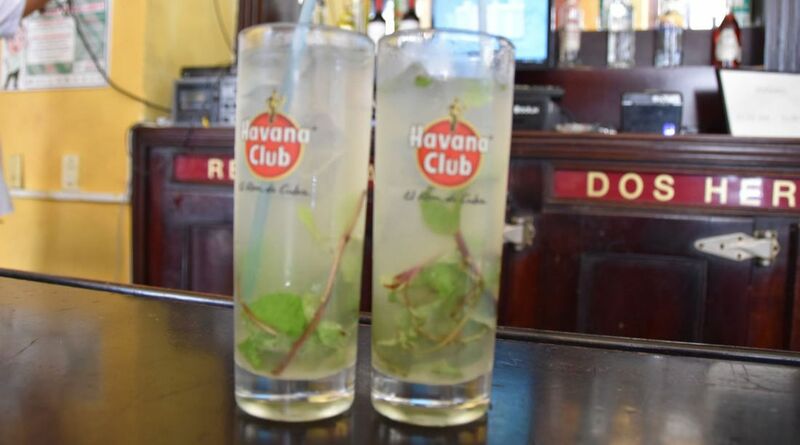 Havana was making a great first impression. Unfortunately, if you want to grab a table at El Cocinero on a Saturday night it's best to make reservations in advance. Our options were to either wait two hours or head to the rooftop bar. We climbed the stairs to the rooftop, then another round of stairs to a platform where we entered a former smokestack to place an order with the bartender. While waiting for drinks we talked with an American who had just arrived from Miami. His flight should have been under an hour but the plane was forced to circle the runway for two hours before receiving clearance to land. With a single runway that can happen. I remember Copa Airlines mentioned that it was possible to circle the runway for hours over the intercom as our plane was leaving Panama City and thinking that was a strange thing to say. Now I know why they mention that. Proliferation of Americans aside, El Cocinero was a cool spot and on a return trip I'd just be sure to book a reservation. 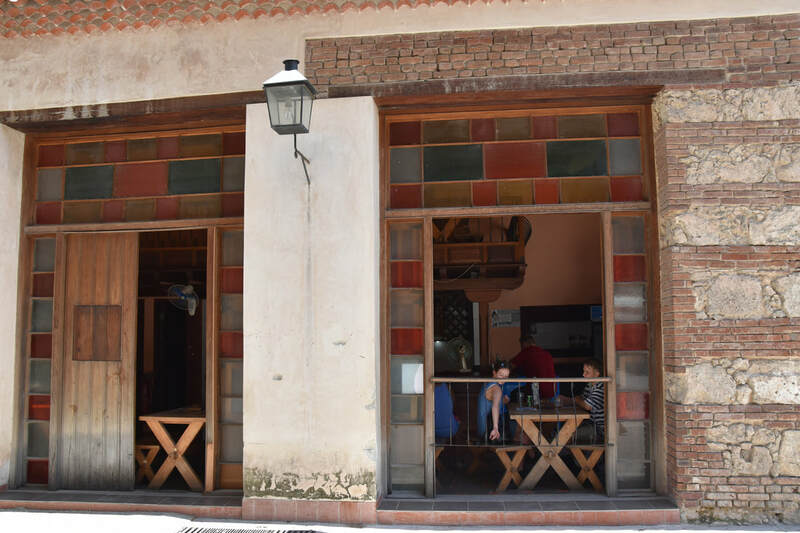 After El Cocinero we made our way over to La Fabrica de Arte which now had a line wrapped around the block - at least it's the sort of place that deserves to have a line wrapped around the block. 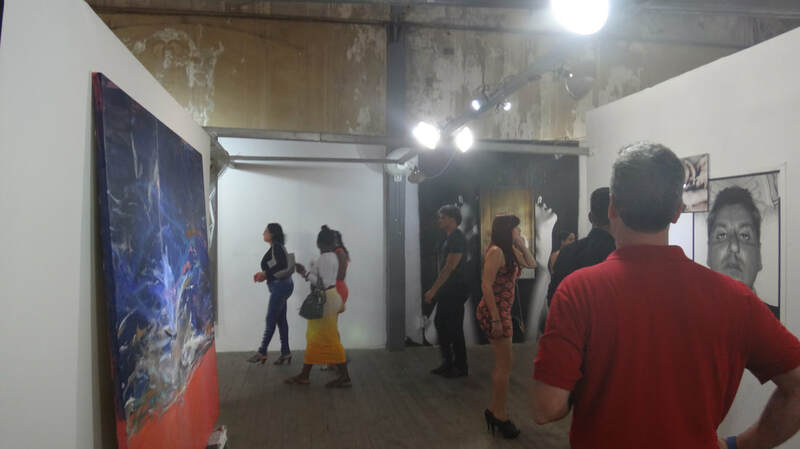 La Frabrica de Arte is part art gallery, part nightclub, part concert hall, part frat house. Upon entry we were handed a card which was then filled out every time we place an order for a drink or food. Considering how chaotic it is inside the system works relatively well. With beers in hand we walked around to the various "galleries" of Cuban modern art, which seems to have an obsession with showcasing naked, fat, and old people - that's a single them combination, not three separate themes. As we walked the galleries there was a constant pumping of DJ music, mostly American inspired rhythms. 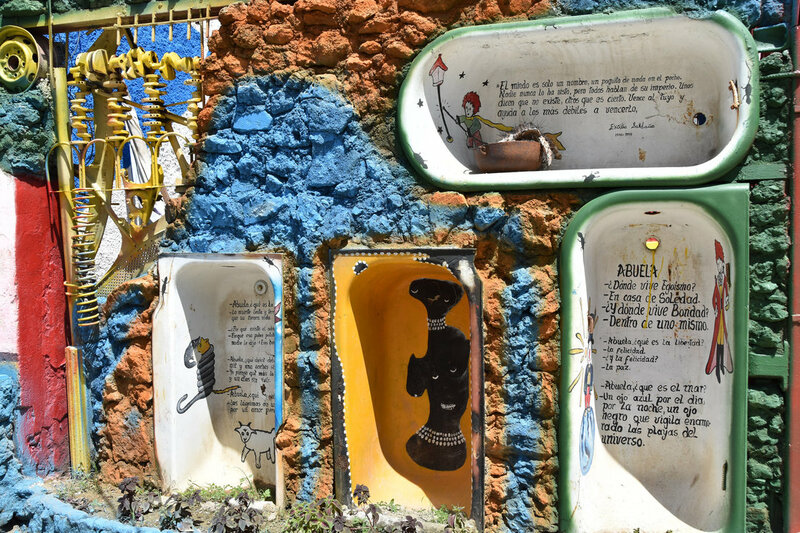 El Cocinero and La Fabrica de Arte aren't just cool spaces in Havana. They'd be cool spaces anywhere. New York. Chicago. Los Angeles. Miami. London. Tokyo. Hong Kong. El Cocinero and La Fabrica de Arte would be the coolest spaces in any of those cities. 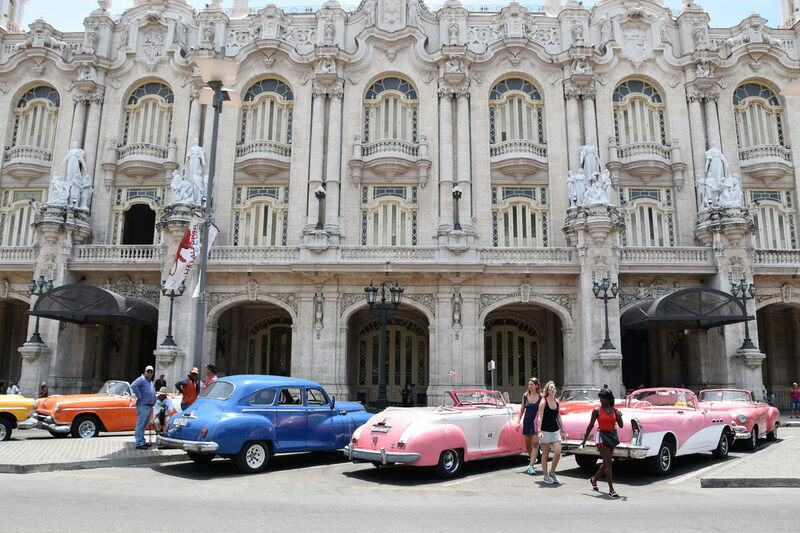 We started out Havana sightseeing at the place all tourists start, El Capitilio and Parque Central. 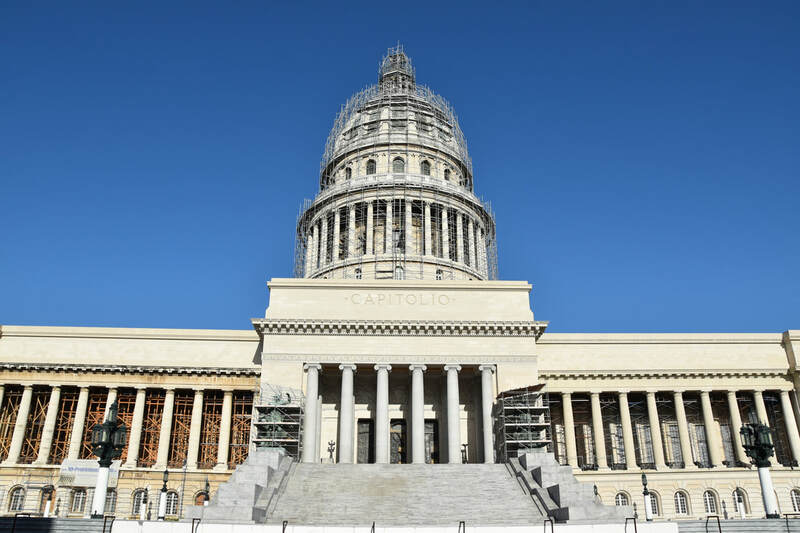 While El Capitolio is not a replica of the US's Capital Building, it sure seems close. 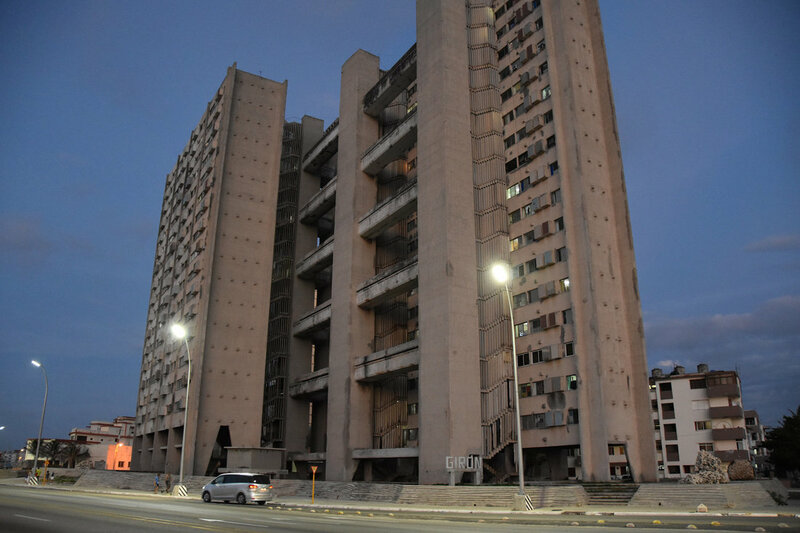 At 302 feet tall, it's also 13 feet taller than the US Capital, which most Cubans will be able to point out to you. And just like the US Capital it appeared to be in a continuous state of rehabilitation. Across the northeast corner is Parque Central, the spot to go to discuss all things Cuban baseball. Assuming Cuban baseball is in season - and since the season only lasts one month, there's a greater than 90% chance people aren't talking baseball. 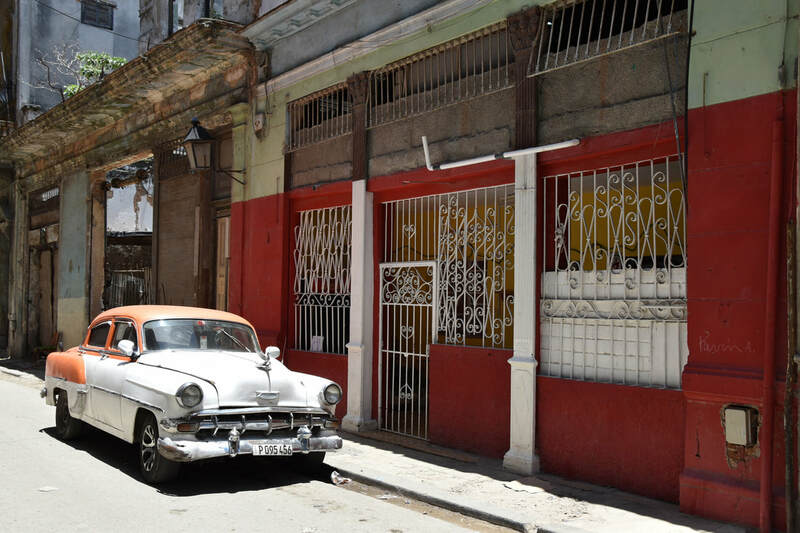 This is also the area to pickup the classic car rides through Havana but first...to Old Havana! I've been to other "Olds" - none, except for maybe Jerusalem's gated Old City area, come close in terms of scale. 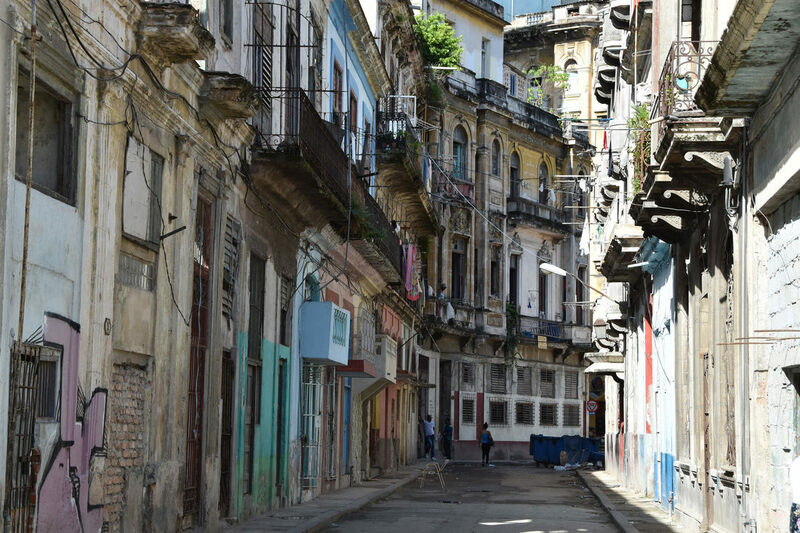 Old Havana is block, after block, after block, of old. It's a walking museum. It's poor. It's beat up. It reminded me of India and Kathmandu without the noise, without the dirt, without having to keep your head on a swivel. 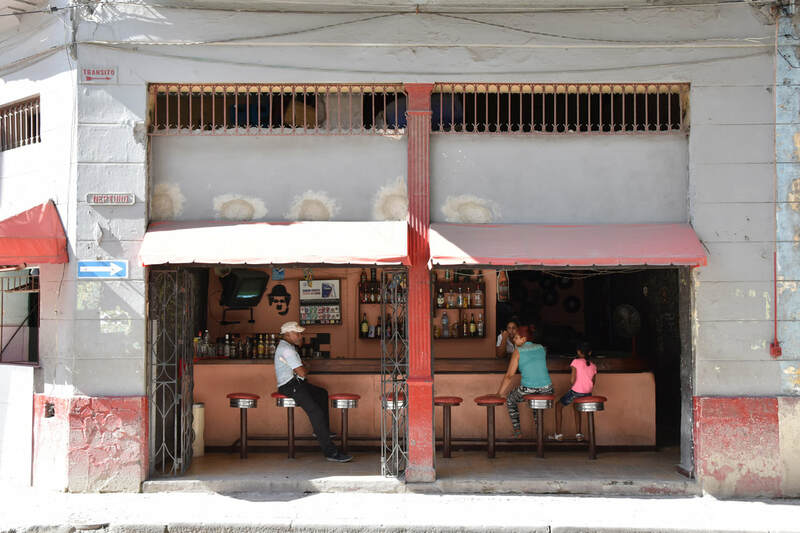 Old Havana is like an Indian city that you can actually relax and enjoy. After the first night's American infused dining and drinking experience, Pete and I decided to mix it up for breakfast. Instead of heading to a coffee house we called an audible and entered some sort of a food hall. It was probably a food hall in it's prior days. On this morning there were a few stalls cooking food and a few others selling prepared food. It was one of those places that as an outsider, when you walk in, immediately someone is descending upon you trying to sell you food. We went to a stand that was cooking warm sandwiches and ordered one pork and one ham sandwich. The sandwiches turned out to not be warm. And were not too good. Pete had a beer and when I asked for a water, the cashier ran next door to pick one up. We went to pay. $10. Proof you can eat local but you can't pay local. 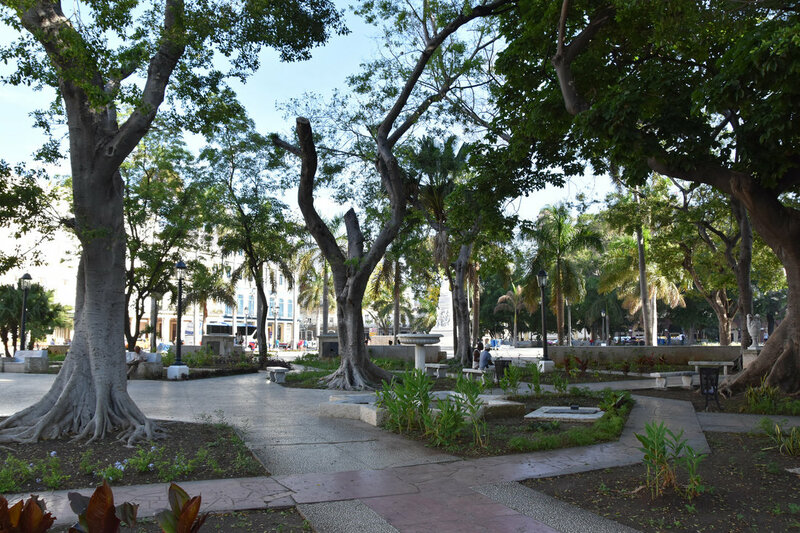 Old Havana has several plazas / squares. 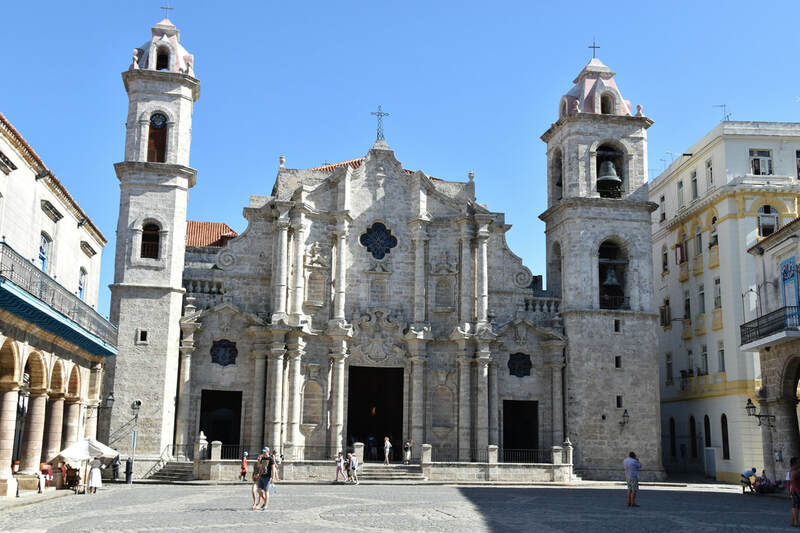 The first we came across was Plaza de la Catedral. 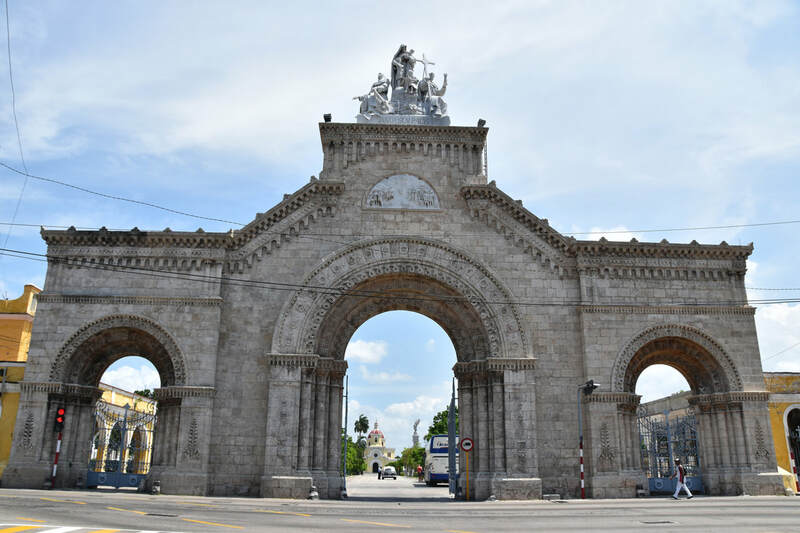 The plazas are the only part of Old Havana that reminded me of other historical Spanish cities, as such, we didn't spend much time in the plazas. 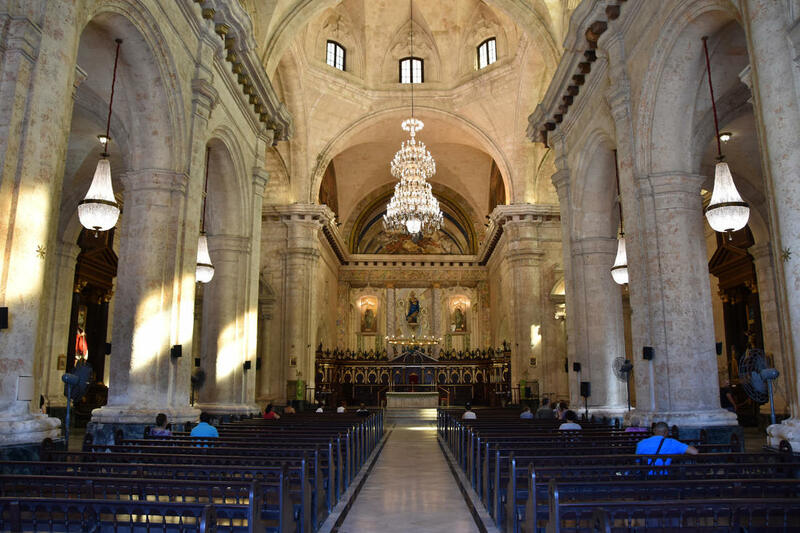 The plazas had a familiar feeling so after a minute at the church it was "let's get back to walking through Old Havana." You've seen one Cathedral, you've seen them all. 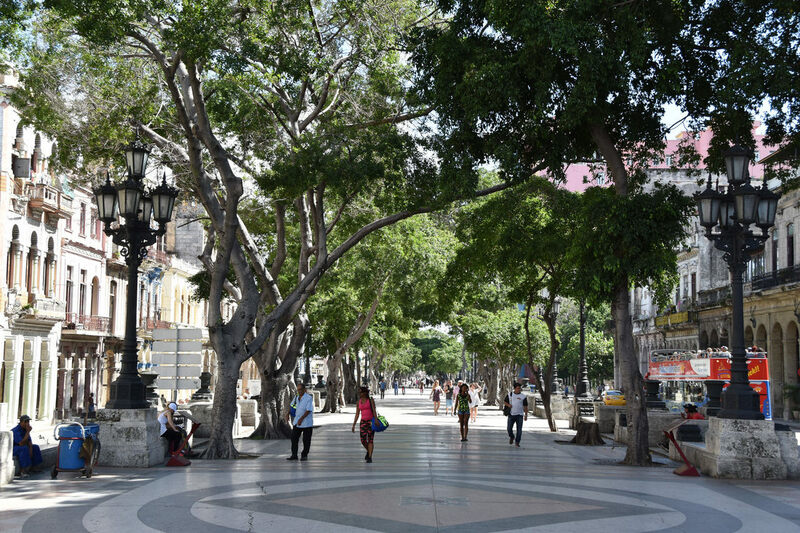 There's not many blocks between Plaza de la Catedral and Plaza de Armas. Off the plaza is the Castillo de la Real Fuerza. 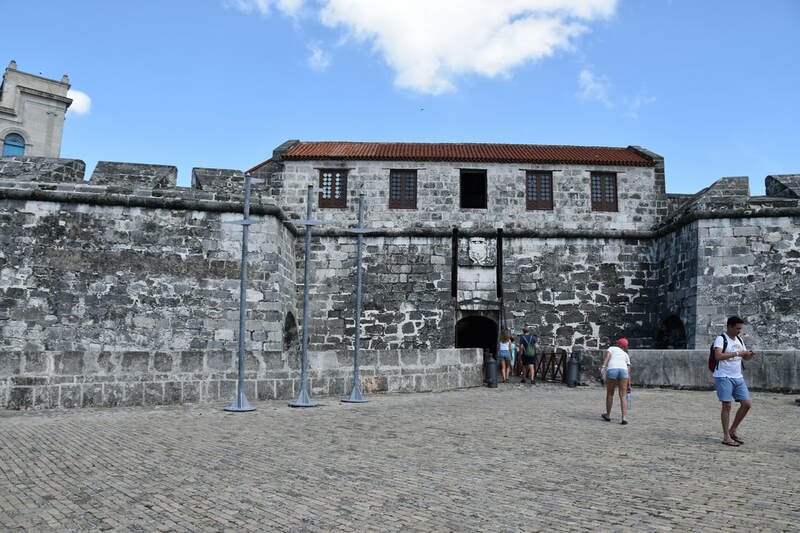 This is Havana's original Spanish fort and much smaller than the Castillo de los Tres Reyes del Moro that sits across the waterway. There's not much to the Castillo - there's a few rooms with a few artifacts and ship models - but the $3 price is reasonable. Now, finally, back to the streets. The streets are so amazing that every time we reached an intersection we didn't know which way to go. Keep walking straight? Take a left? Take a right? Each time we were ready to turn around, we said, no, let's go one more block. Per my FitBit we walked thirteen miles for the day - I think at least half of those miles came after saying "let's go one more block." At the plazas and major streets there were fancy street signs, otherwise it was somewhat difficult to figure out where exactly we were in Old Havana. Blocks seemed to be both short and long making it seem like you've walked nowhere and off the map at the same time. There was some street art, but not much. There were some references to Fidel Castro and Che Guevara, but not much. I expected a much higher level of indoctrination - a Mao-level type of indoctrination - but the Fidel and Che references were few and far between. 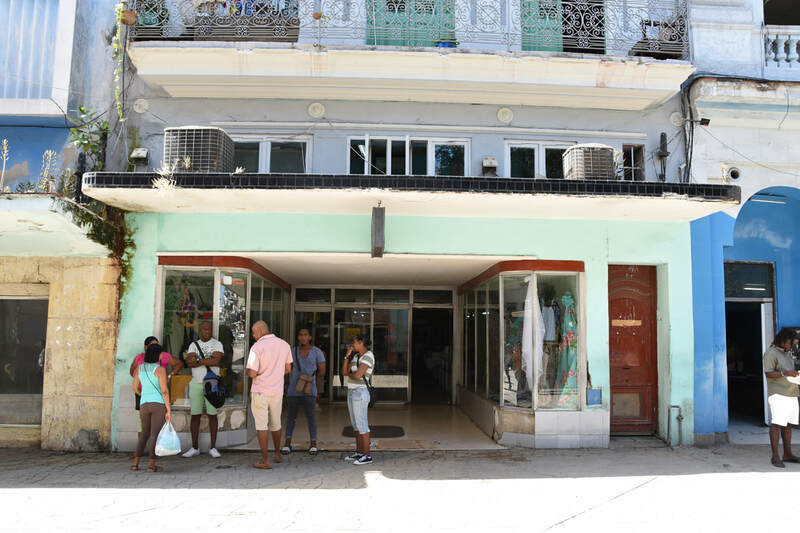 Even with the Cuban tourist currency, there were no references to Fidel or Che. Overall there seemed to be a lot more Che references. 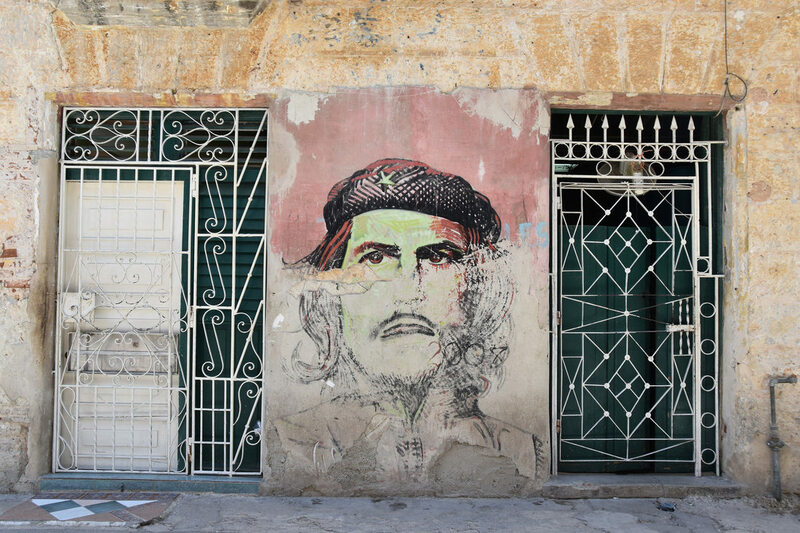 Whether it was street art, tourist tchotchkes, and local advertisements, Che was the dominant figure. We kept going, block after block. Old Havana appeared run down, almost abandoned, yet most of the buildings appeared to be occupied. 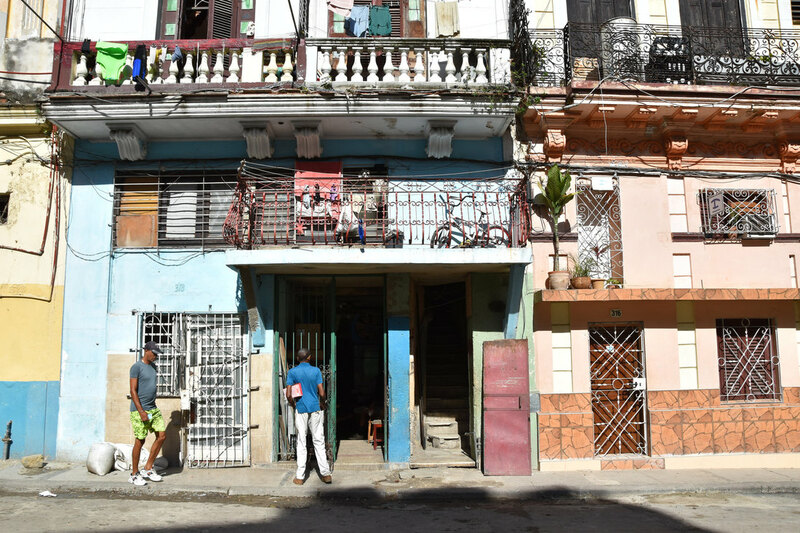 At every door opening I tried to glance in to see how the interiors of the Old Havana homes compared to those in Vedado. 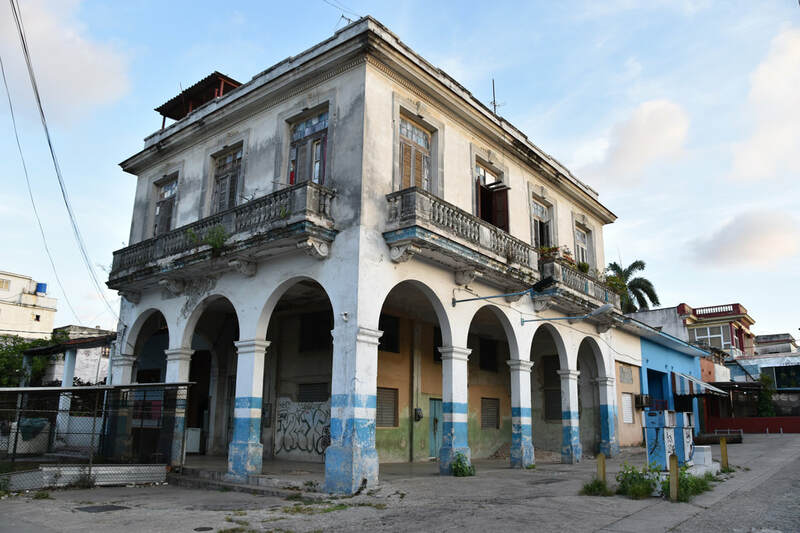 They appeared even more worn - if Vedado appeared to not have been touched since the 1950s, then Old Havana hadn't been touched since the 1850s. 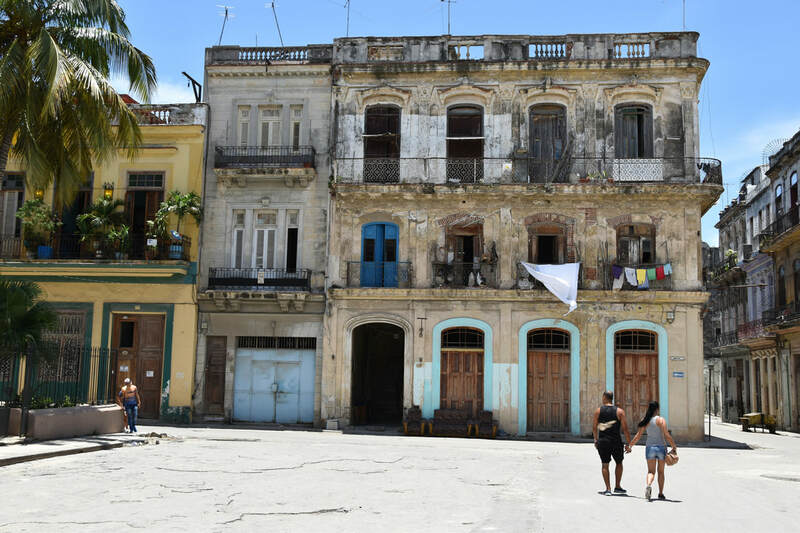 Aside from the tourist hotels and restaurants, Old Havana was...well...old. If the poor and homeless were hoping for something bigger from the Revolution, I think they must still be hoping. At least they aren't homeless. 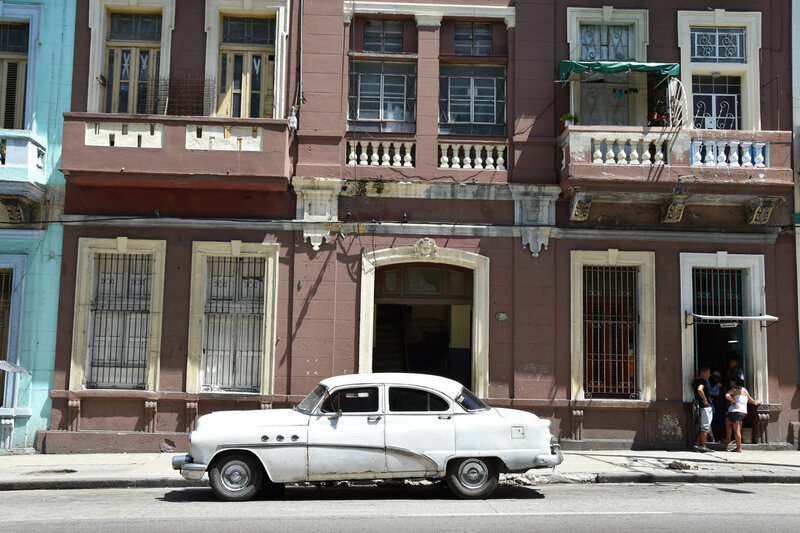 In all the Havana and Cuba photos I saw there always seemed to be a classic car. Before arriving I questioned whether or not those were staged photos - how could there always be a 1950s automobile in the exact perfect location? 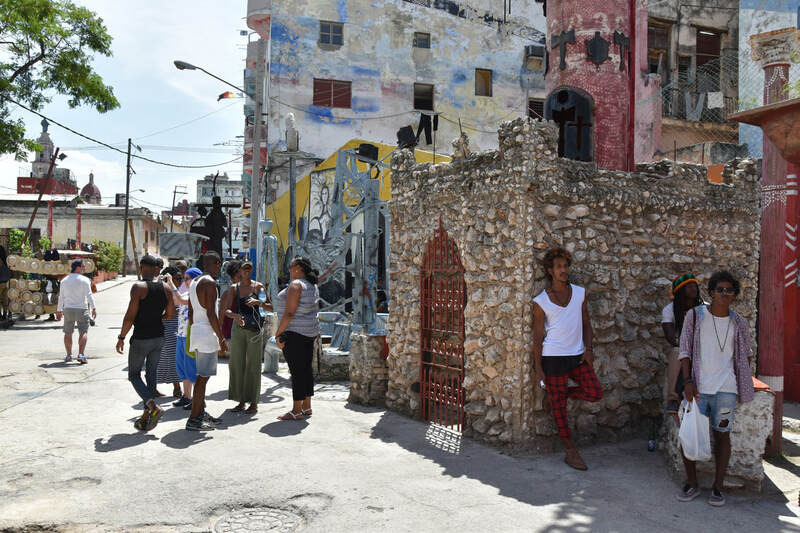 After an hour or so in Old Havana I know longer questioned the staging of those photos. The old cars are everywhere. You can't help but not capture them in a photo. 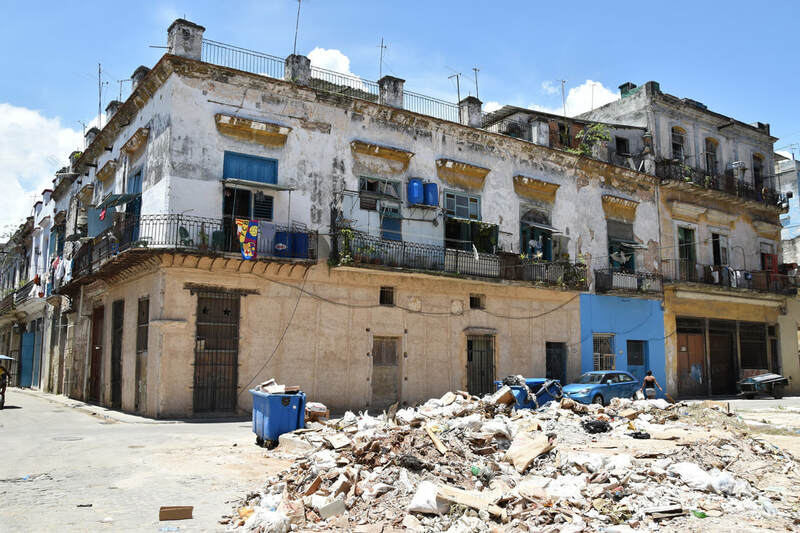 One of the Old Havana images I don't remember seeing in a guidebook or photo collage was a huge pile of trash. 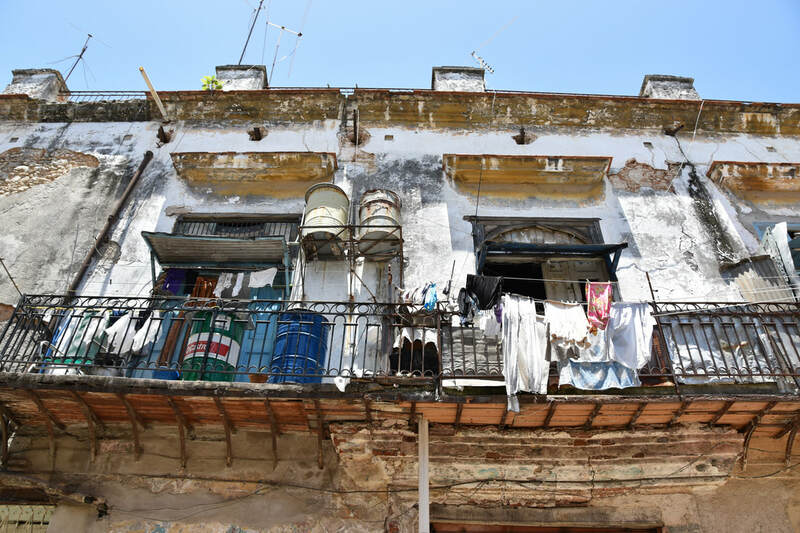 Old Havana was dirty but nothing overly revolting, however, every so often, the filth was taken to a new level. During our walk we occasionally came across an intersection or an open space between two buildings with massive piles of trash. 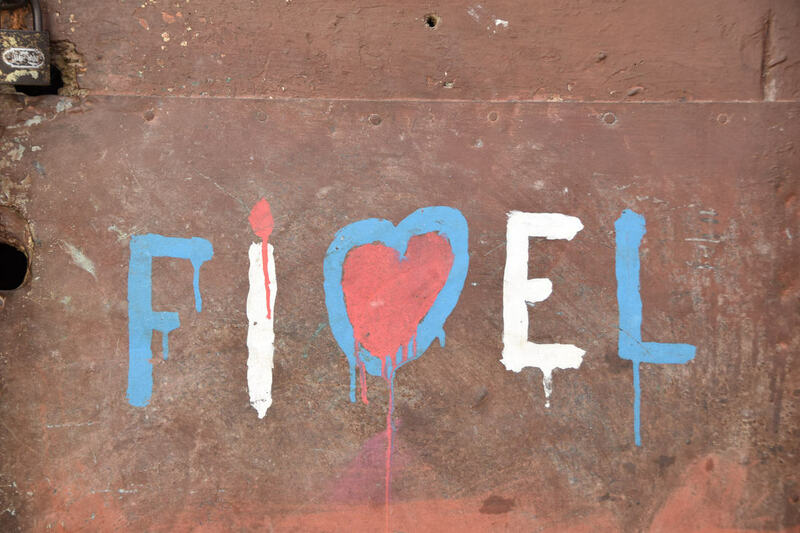 We saw this a few times in Central Havana too. 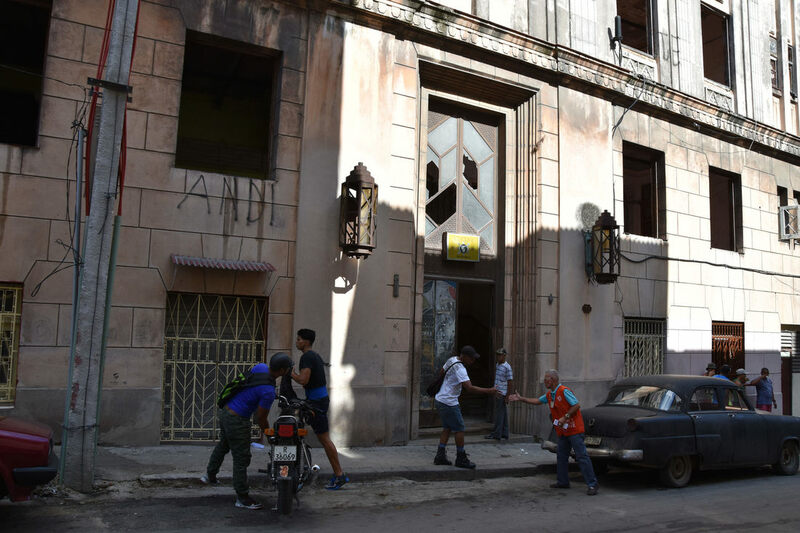 The only thing I can think of is that Havana does not have house to house trash collection and alternatively residents are instructed to bring their trash to a designated intersection. Fancy old cars. Piles of trash. 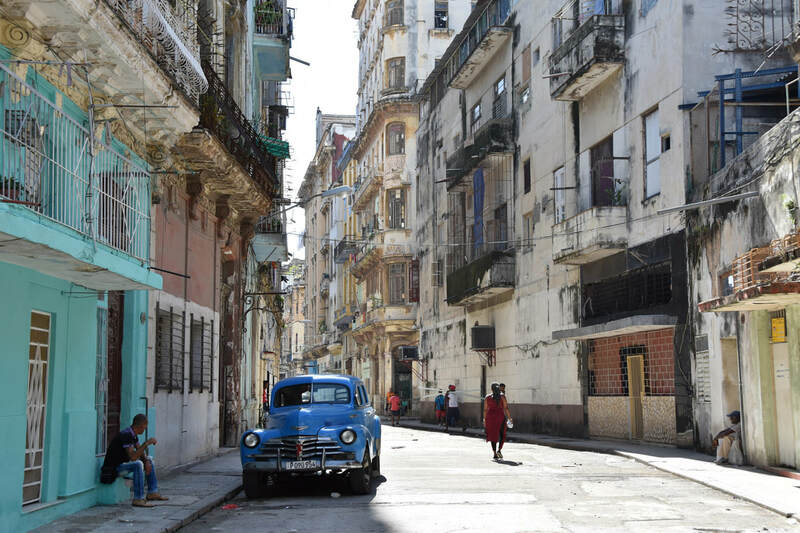 Old Havana. 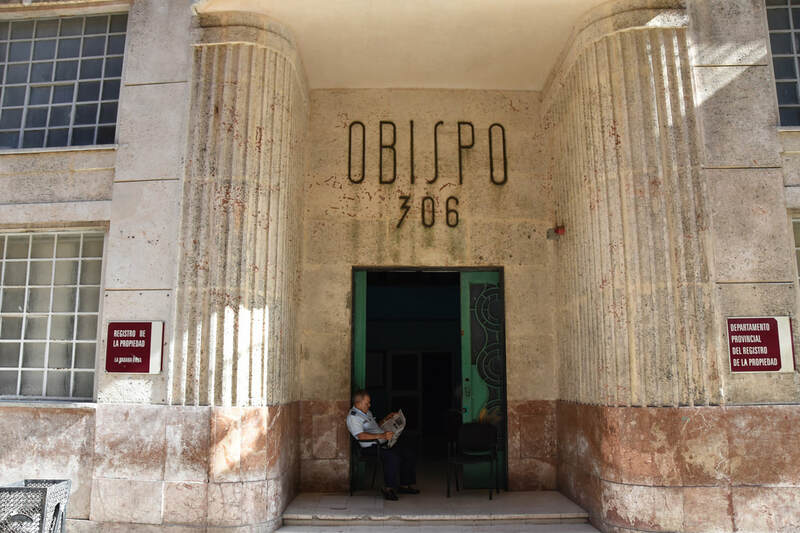 Dos Hermanos was one of our favorite places in Havana. Was it because Pete and I are Dos Hermanos? Was it because as soon as we sat down a band came in and started playing La Bamba (actually a Mexican song but the time I thought maybe it was Cuban? Was it the Anthony Bourdain-esq local who sat beside us at the bar and waxed poetically about all things Cuba? Maybe we just timed our visit well because even though it's in the guidebook it was full of tourists when we arrived? I don't know. 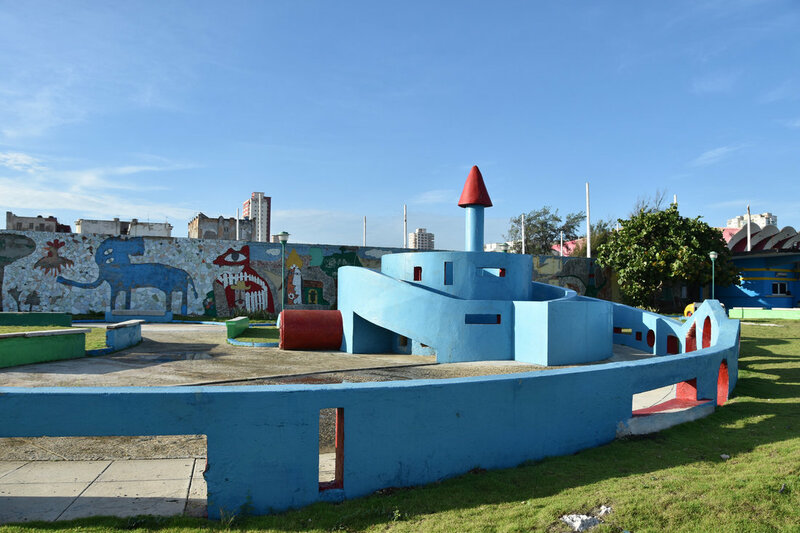 We became incredibly lost trying to find the place which is somewhat embarrassing given its right on a waterfront road and across from the Havana Club Rum Museum. 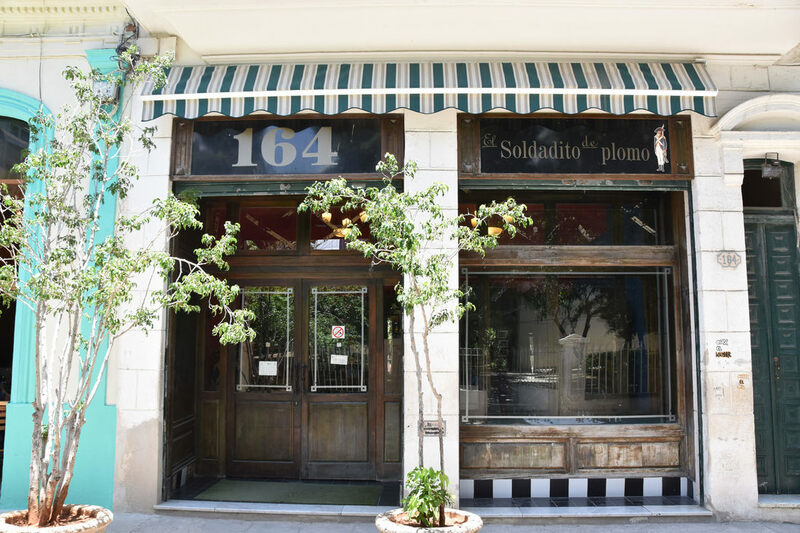 All the American celebrities from Marlon Brando to Ernest Hemingway hung out here, and unlike some of the celebrity havens we visited later, I can actually believe they hung out at this historical and gritty place. 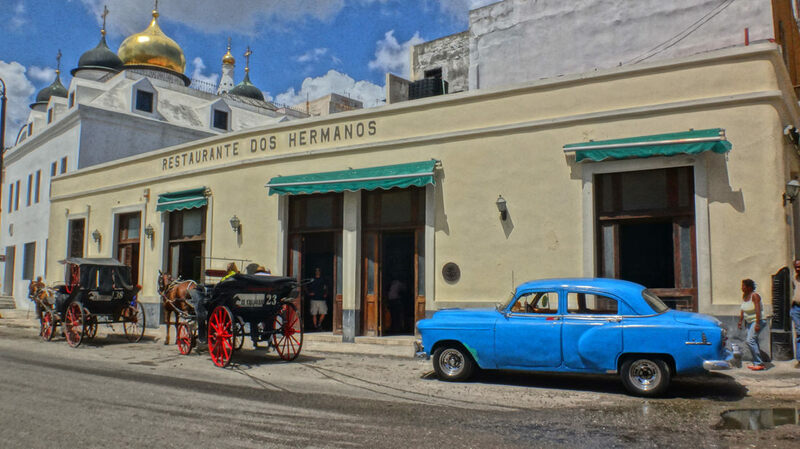 Dos Hermanos is supposedly the birthplace of the Cuba Libre, aka, the old Rum and Coke. Whether that claim is true or not (most likely not given the drink is older than the bar) it didn't stop us from ordering the drink and a mojito. 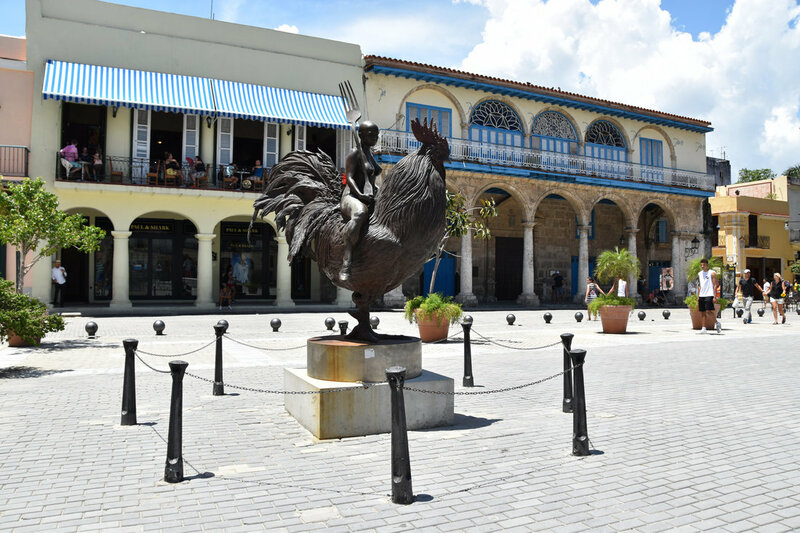 After Dos Hermanos we started heading back to the El Capitolio area with a stop in the last of Old Havana's major squares - Plaza Vieja. 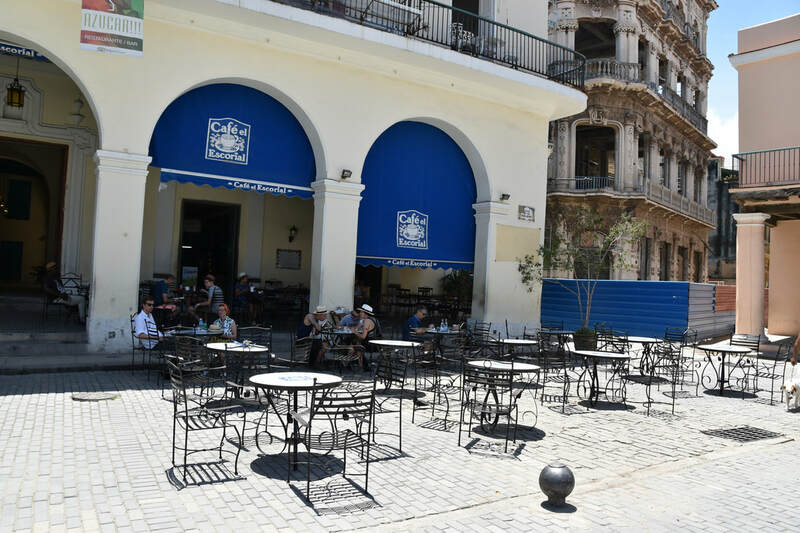 I thought this was, by far, the best of Old Havana's square because unlike the other squares, there were plenty of restaurants to sit and people watch. Tourist people watching but people watching none the same. 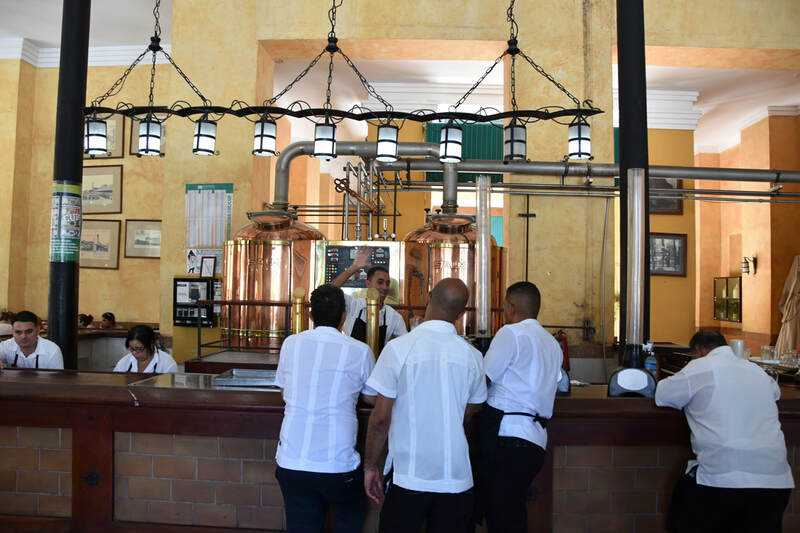 Plaza Vieja is home to one of Havana's Microbreweries, Factoria Plaza Vieja. In addition to beer it is also the purveyor of the worst Cubano sandwich ever. Or the best. All the other Cubano sandwiches I've had over the years just don't compare. The real Cubano sandwich has one slice of ham and one slice of cheese. Not heated. 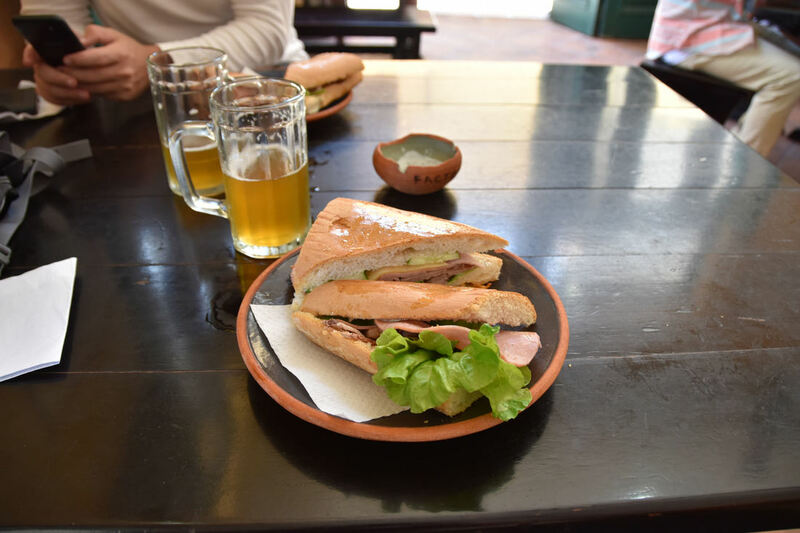 If you weren't in Havana you may think it was just a ham and cheese sandwich. At first I was disappointed, then I became a bit sad...the lack of meat is probably because there is a lack of meat...in the entire country. So I shouldn't be so cynical. The bread was good though. 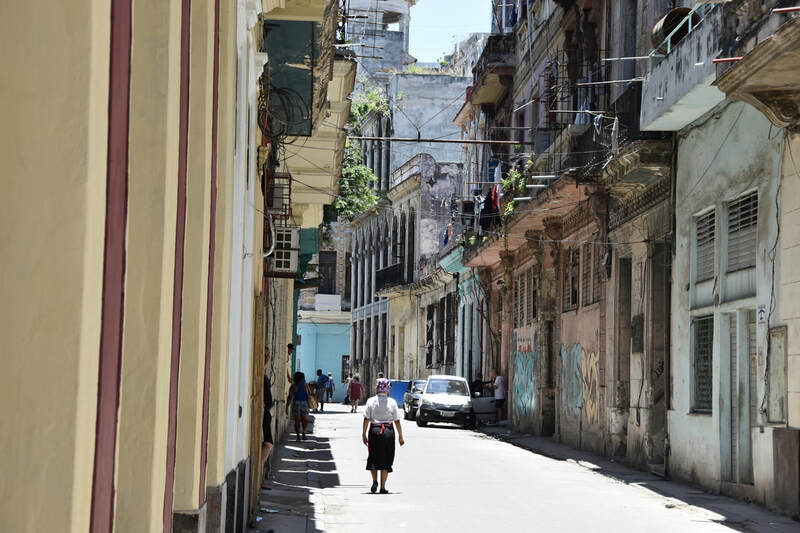 After lunch we kept zigzagging back and forth through the alleys of Old Havana on our way back to the El Capitolio area. One more drinking stop on the way. 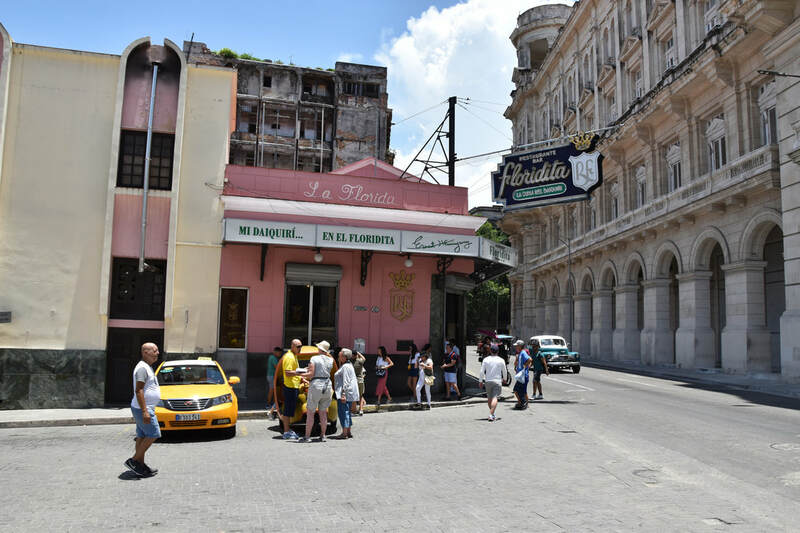 At some point the walk through Old Havana leads to El Floridita. 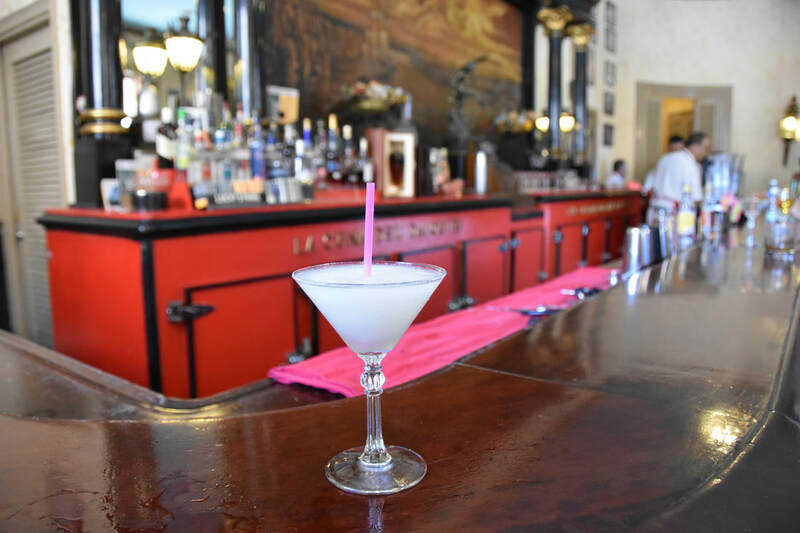 We all came to Havana to pretend to be like Hemingway and at some point that involves ordering a daiquiri at El Floridita. There's a life-size statue of Hemingway in the near corner of the bar but one has to consider that in 2017 would Hemingway dare show his face here. The bar is overrun with tourists. Fortunately Pete and I were able to grab a seat at the bar as a couple was leaving. The daiquiri was quite alright. On a warm day the bittersweet slushy drink hit the spot. 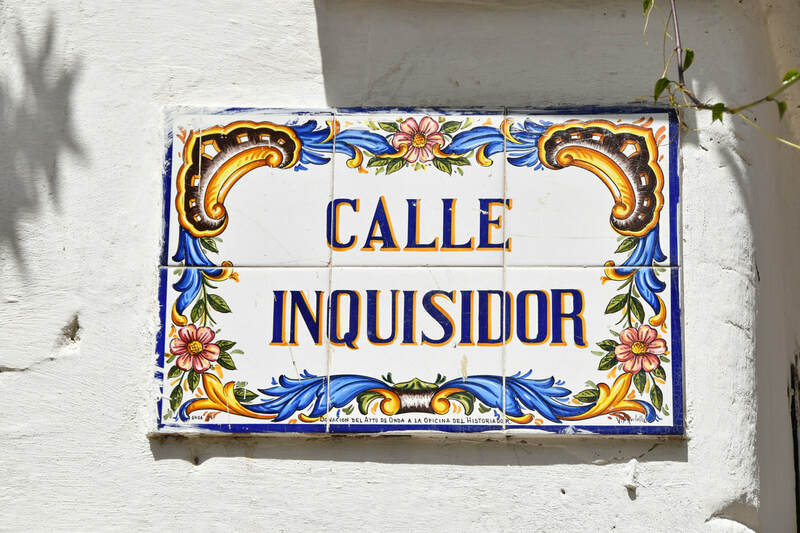 If drinking a daiquiri at El Floridita checked one box, we checked a second box a few minutes later. 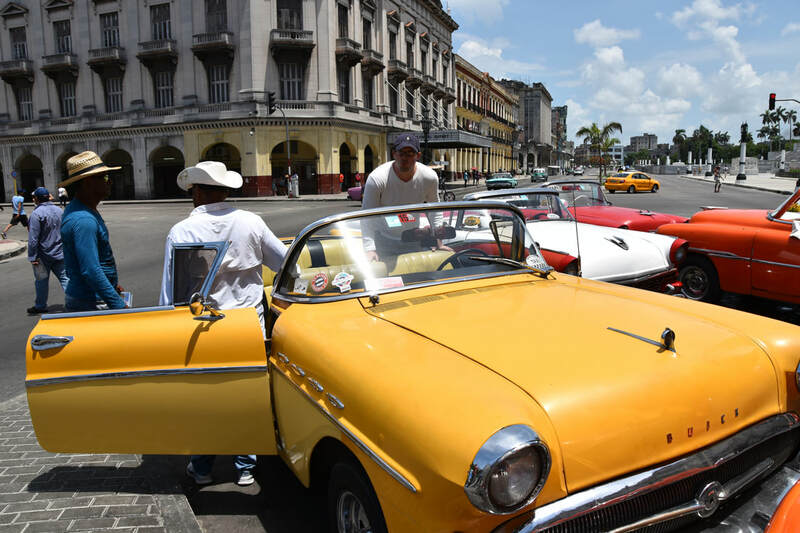 We made it back to the El Capitolio / Parque Central area for a cruise around Havana in a classic muscle car. I didn't have quite the travel fantasy of riding around in the convertible as Pete did so I let him pick the car and negotiate the price. 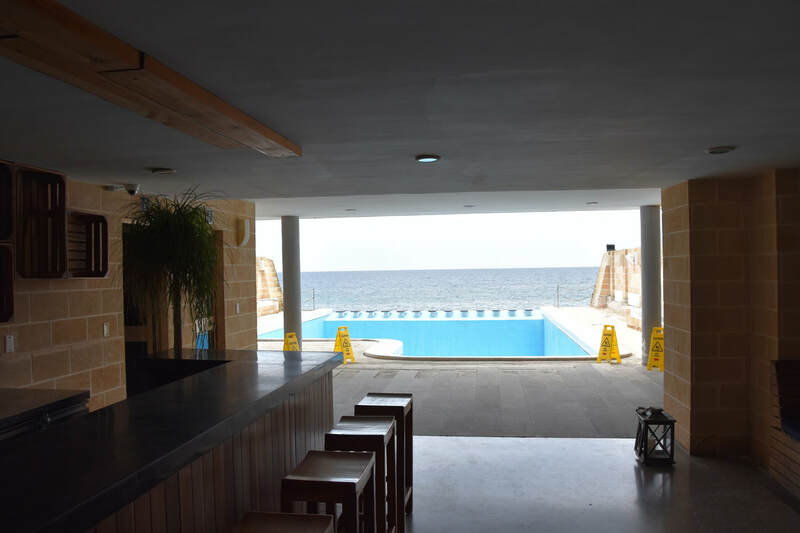 The one thing we both agreed on is that we did not want to do the full three hour circuit and we wanted to be dropped of at a different destination from where we started to avoid another taxi fare. Pete picked an awesome yellow convertible. As soon as my legs hit the seat cushion I knew we may have made one mistake so far in our travels - we probably would have been better off taking the classic car ride earlier in the day, before the seats were so hot they could burn your legs. Even though we were in a convertible, I still dreaded the first thirty seconds of getting back into the car whenever we exited to see a site. 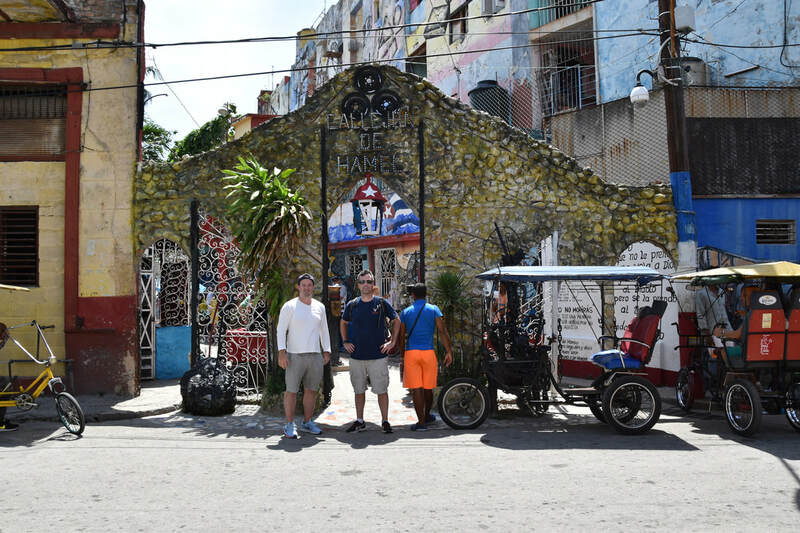 We did a loop through Central Havana, over to the west side of Vedado, then back to Calle Hamel in Central Havana. 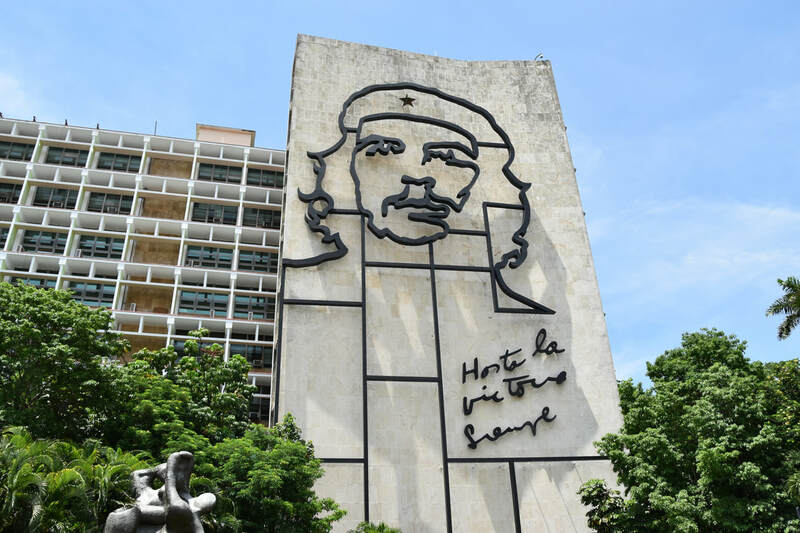 During the car ride our first stop was at the Plaza de la Revolucion which features two large metal images of Che Guevara and Fidel Castro. Che always seems to get as much love as Fidel. We then drove by the Necropolis Cristobal Colon, Havana's major cemetery on the way to John Lennon Park in Vedado. The entire John Lennon park thing seemed strange to me. I recalled a conversation I had with someone in Bulgaria who said that the Communists banned all Western music and it wasn't until after the fall of the U.S.S.R. that the person heard their first Beatles music. John Lennon seemed to have a similar fate in Cuba where the Beatles and his music was banned up until 2000 when Castro did an about face and embraced Lennon as a revolutionary and rebel who was a victim of U.S. harassment. 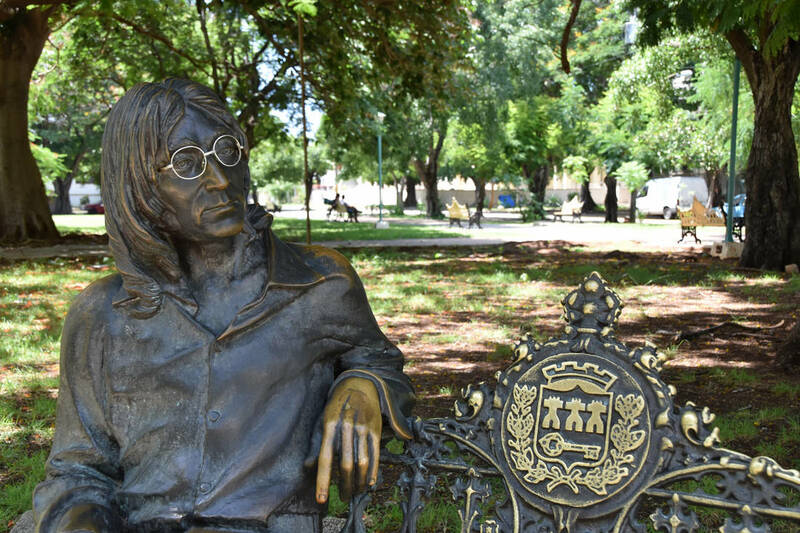 I still don't get the logic of renaming a park after Lennon and placing a statue of his likeness on a bench in the park but then again there's a lot about Cuba I don't understand. Lenin Park? Ok. Lennon Park? It's a bit of a head scratcher. If nothing else it's a popular photo stop. A Cuban sits there and plays John Lennon songs over a mini boom box as car load after car load stops for their photo with Lennon. 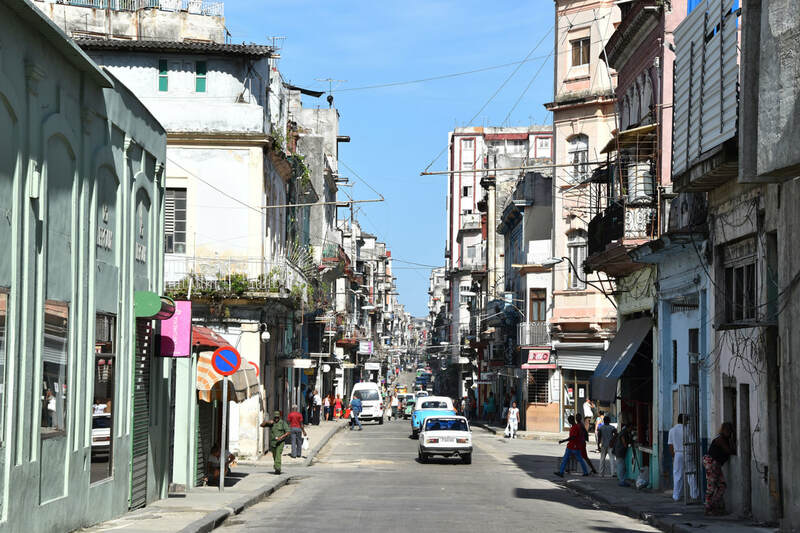 We had the convertible driver drop us off at Calle Hamel, which besides an amazing street name, is also popular for showcasing the Havana's Afro-Cuban culture. As soon as we exited the car we had our photos taken in front of the Calle Hamel sign which brought over a few locals eager to get in on the photo action, including one who started bending backwards down to the ground as if he were in a limbo contest. 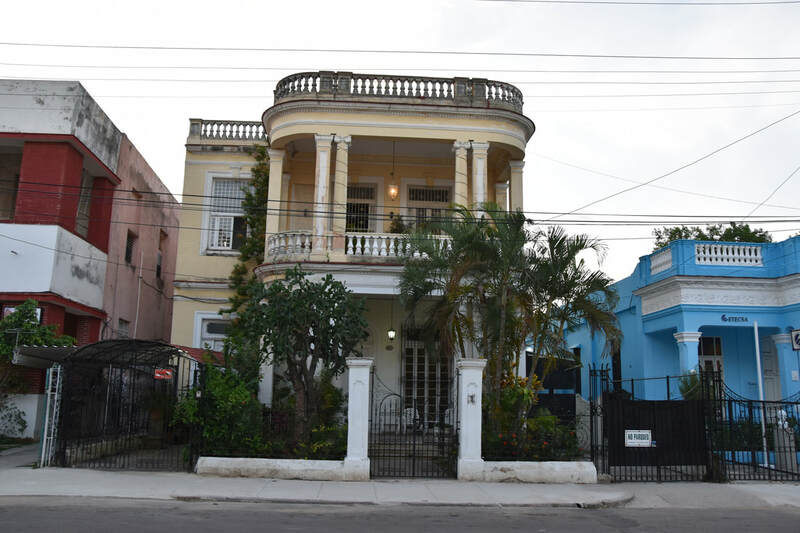 Calle Hamel is not much more than two blocks. There's some music. There's some interesting art - a mural of bath tubs and urinals. There's a lot of people just hanging out. The only thing that seemed to be missing was a restaurant or a cafe where you could linger around and enjoy the atmosphere. We weren't here for much longer than ten minutes. 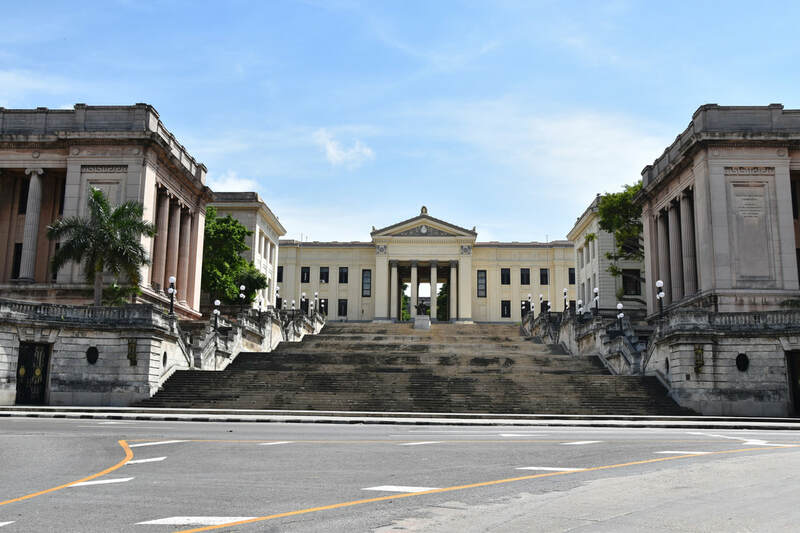 From Calle Hamel we walked along San Lazaro to Calle L past the Universidad de la Habana. A great street of architecture but with the mid-afternoon sun beating down not much shade to enjoy the walk. If we made a mistake it was not doing a loop south of here and Calle Hamel, however, but the ride in the heat it made sense to take the shortest route to a local ice cream parlor. 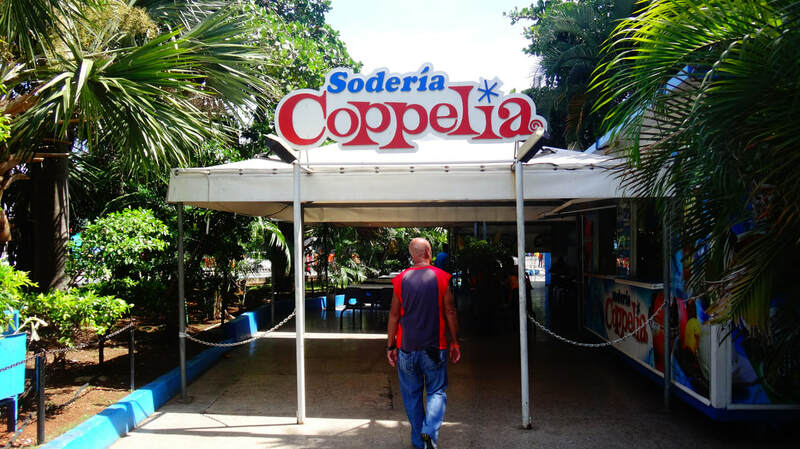 After what felt like an eternity due to the heat, Pete and I finally reached Parque Coppelia and it's famous ice shop - as we approached the center of the Parque two security guards directed us away from the main complex to a stand. Apparently the tourists order ice cream separately from the Cubanos. Not sure why - obviously we paid more - but they could just have easily had separate pricing at the main complex. We did avoid a line. The ice cream was cold but not as sweet as American ice cream. 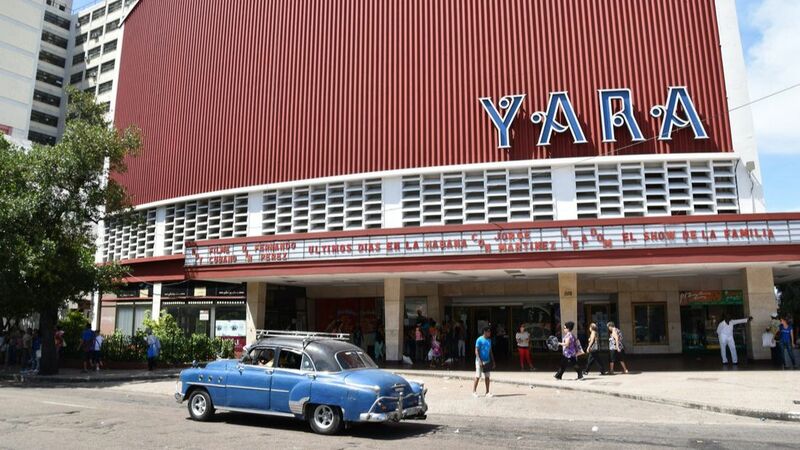 Across the street from Parque Coppelia was the Yara, a magnificent, Mid-Century Modern movie theater. Nothing from Hollywood but several Cuban and International films were playing. 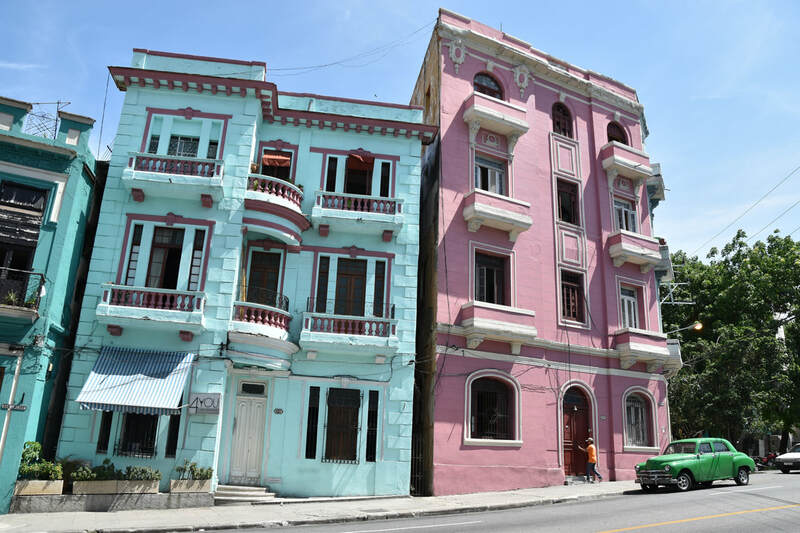 Every block in Havana has some Yara, like building, but the Yara is definitely at the top of any list. 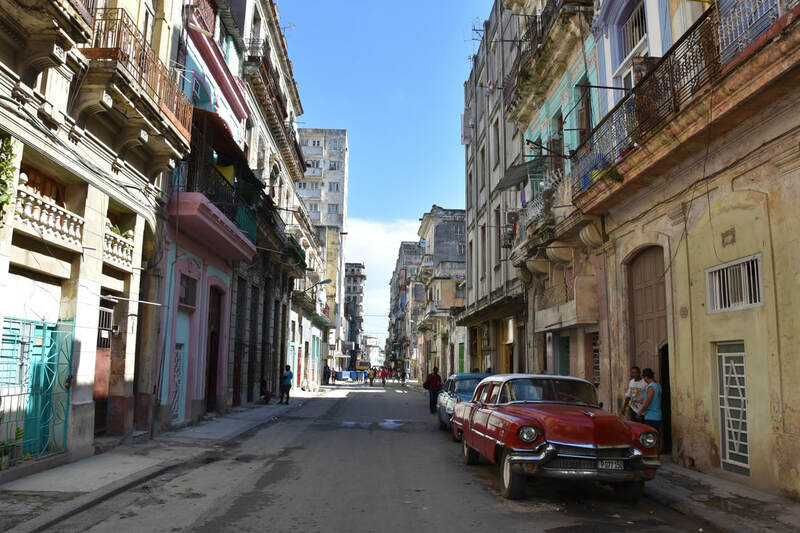 Every block makes you think how amazing Havana must have been, how amazing it could be...but you also think what do Habaneros want? Do they want modern cineplexes with the latest action films? Do they appreciate being stuck in a time warp? Obama's stayed here. Bourdain's stayed here. 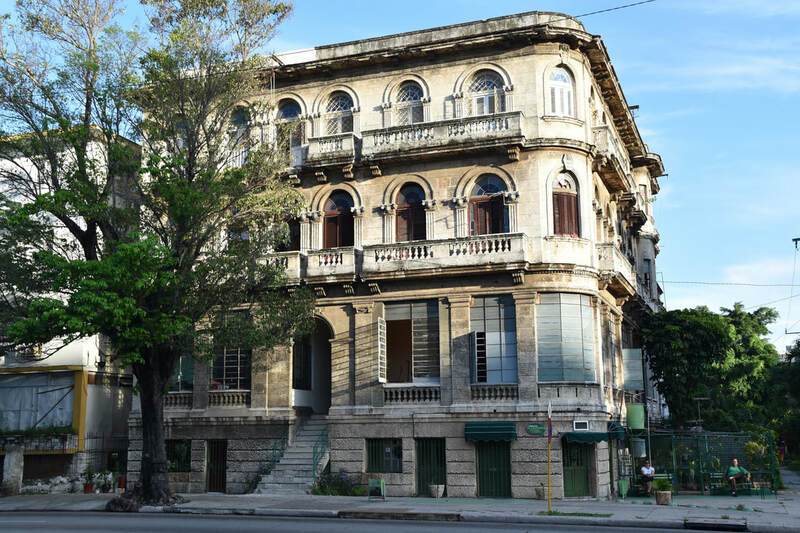 Every famous American who visited Havana prior to 1960 stayed here. 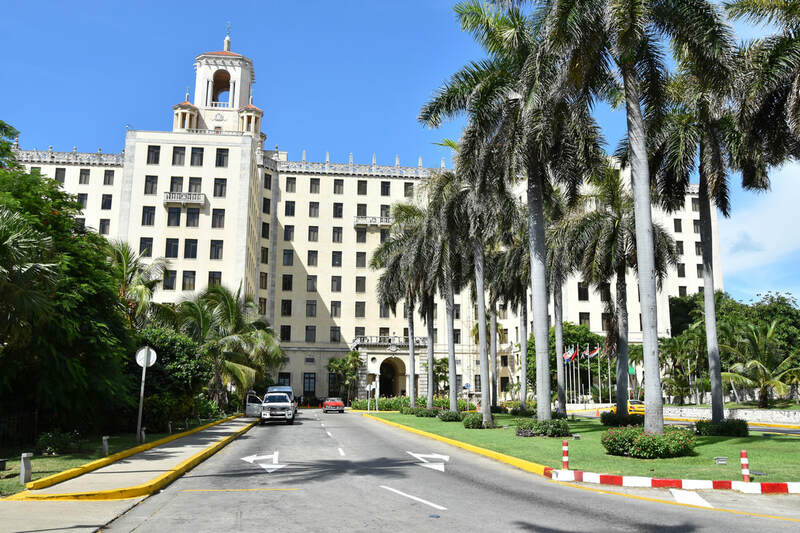 It is of course, the Hotel Nacional. I drank a beer here on a sunny, Sunday afternoon. Years of communism have done little to diminish the poshness of the hotel and as of July 2017 the Americans have returned in force. I found a seat in the back lawn, ordered a beer, and enjoyed the view. Pete searched for bunkers built during the Cold War. I definitely picked the better option, although if it came down to staying here or the Airbnb, I'd still stay at the Airbnb. 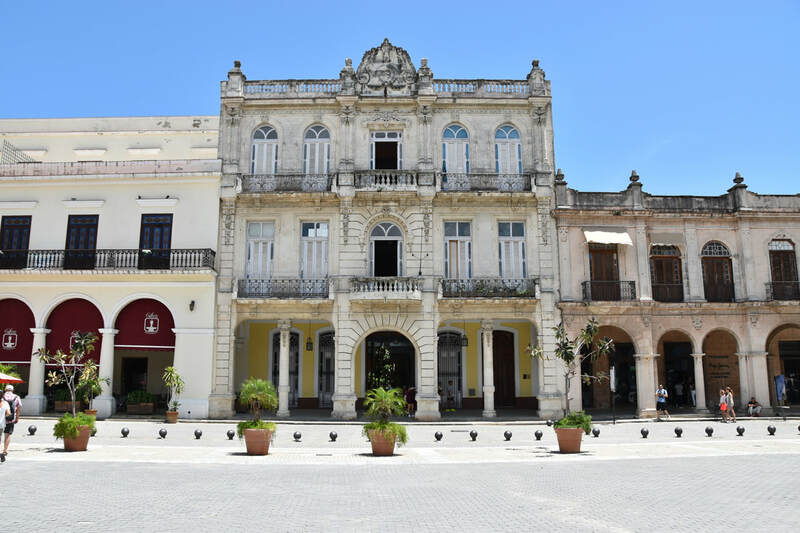 The poshness is nice but staying here is a world away from Havana. From the National Hotel, Pete and I grabbed an early dinner at Cafe Laurent. This was our first Paladar experience and Cafe Laurent did not disappoint. 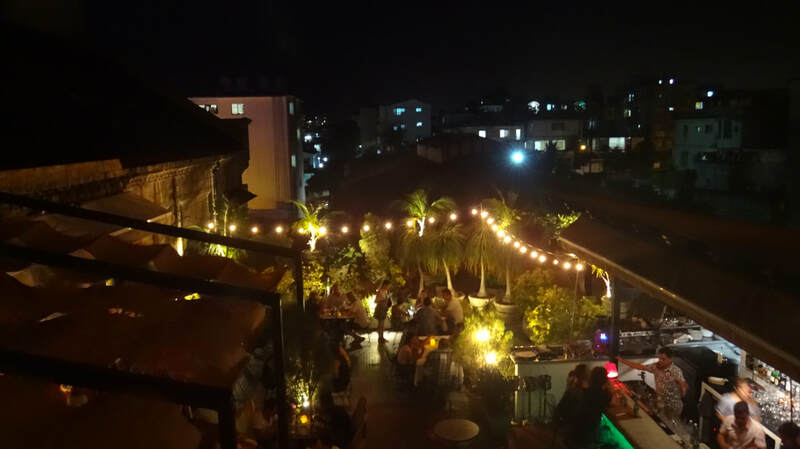 The restaurant is located on the sixth floor of a town house with a dining area that opens to a balcony. The food was good, the views were good too. Across the way was a once spectacular apartment complex. 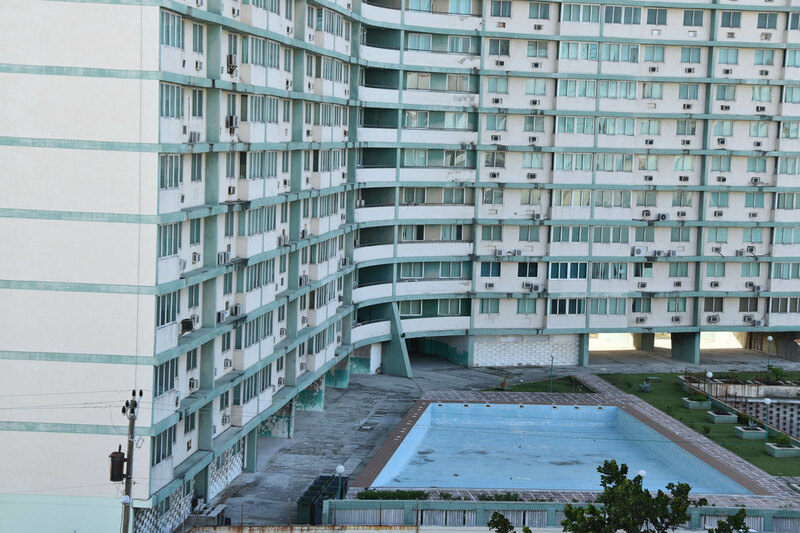 On a warm July day the pool and the rest of the complex stood empty. After the meal we hopped into a Coco taxi for the ride back to the Airbnb. Cubans love to hang out outside. Without internet. Without TV. Without A/C. What else are you going to do than hang out outside, talk, and play dominoes? 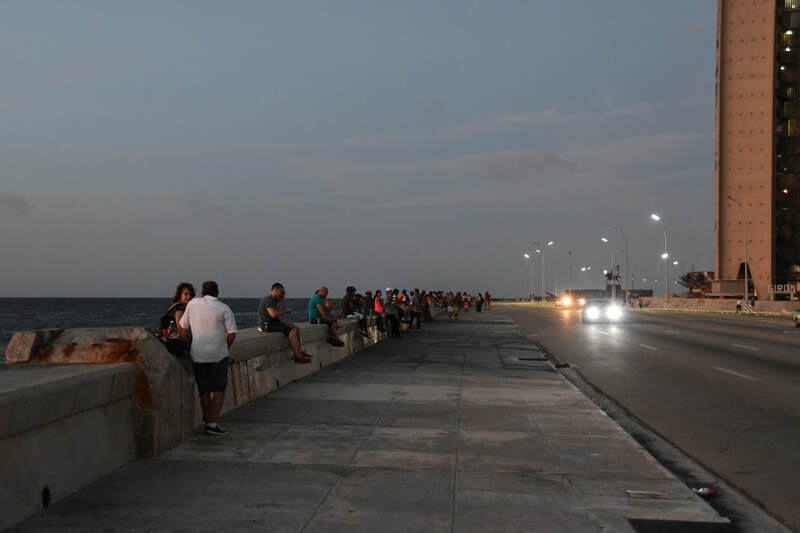 The favorite gathering spot is the Malecon - a roadway and seawall that stretches for about five miles along the north coast of Havana. 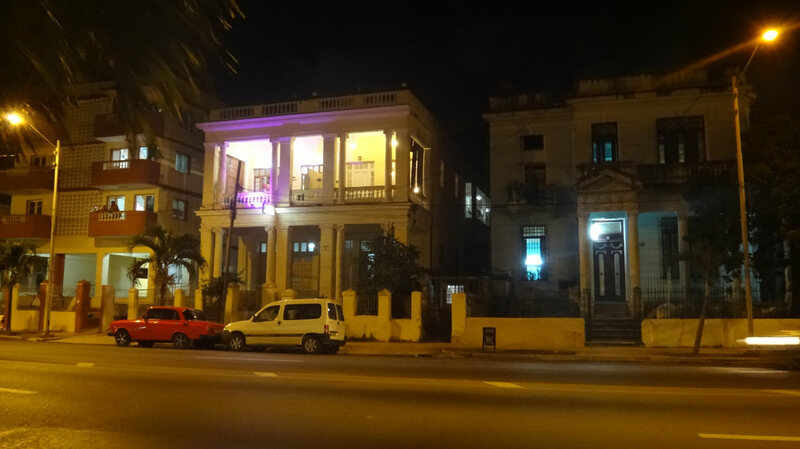 We walked through Vedado, passing former grand home after former grand home, on the way to the Malecon. 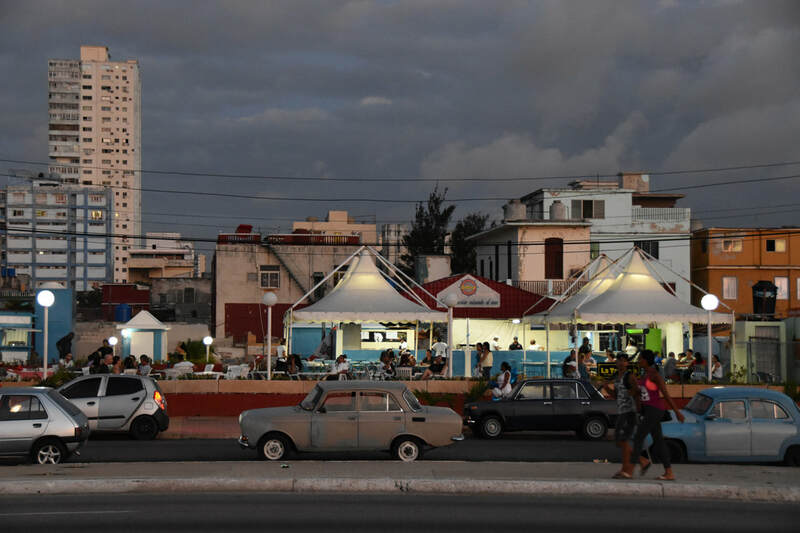 At night Habaneros head up to the Malecon and sit with their feet dangling over the seawall to the ocean below. For prime, ocean front property, that's not many, if any, new construction. 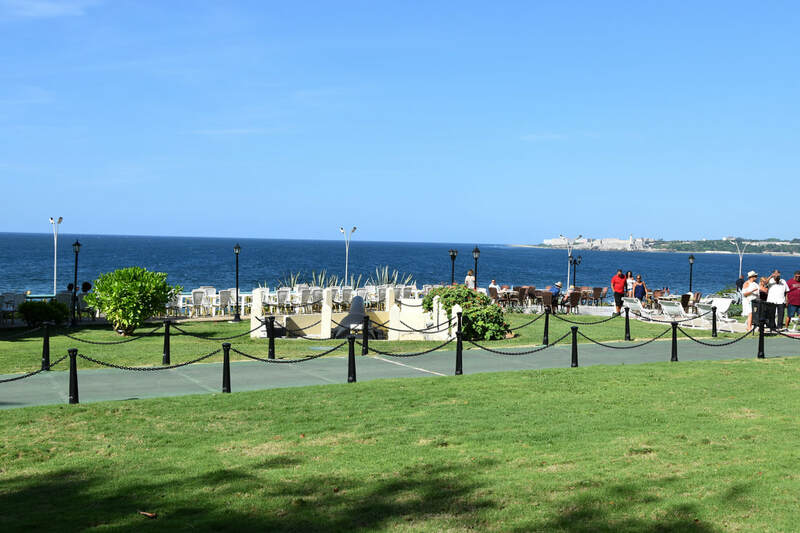 The Old Havana section of the Malecon has the old buildings while the Vedado section has a couple of restaurants and places to grab a beer. 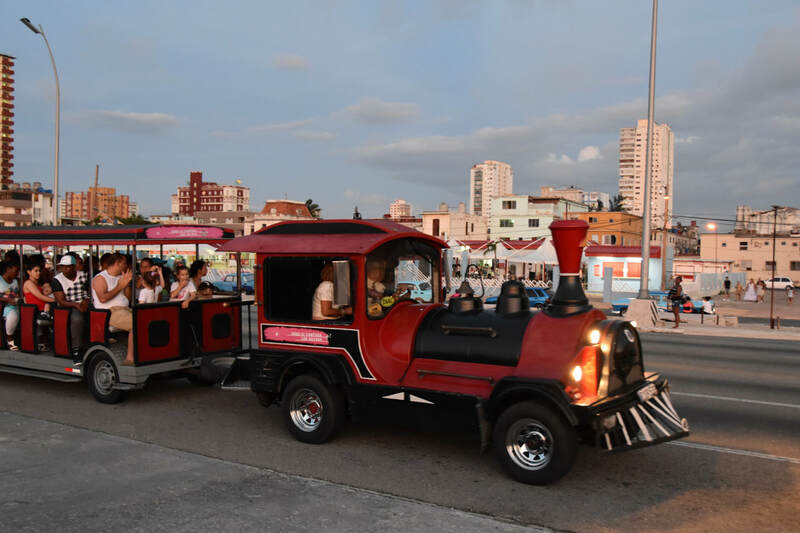 While hanging out on the Malecon I saw one of the few recreational activities open to Habaneros - a toy train pulled up and was shuttling people up and down the Malecon. Walking home, along Avenida Paseo, I began to hear a faint sound of rock music in the distance. I kept walking and the sound grew louder and I could recognize a Led Zeppelin song fading at the end. Then the Bachman Turner Overdrive classic Takin' Care of Business started blasting through the neighborhood. The music was emanating from the side yard of a mansion on El Paseo. I figured nothing ventured, nothing gained; what's the worst that could happen, I'd stumble upon a private party and not be allowed to enter? The mansion was closed but a path lead to a side yard and a band playing 70s and 80s rock on a stage. I looked around, no one was checking IDs or asking any questions. I saw someone selling beer behind a makeshift bar. $1 for a Cristal. I sat down and soaked in the experience. It felt like I was at a sixty year old's birthday party with fifty of his closest friends. Everybody seemed to know one another. They were all rocking to classic rock music. The band even worked in some Spin Doctors. Unfortunately after five songs the band's set came to an end. They must have been the last band of the night because after they were done playing, they and a few others began packing up their instruments. Was this a bar? Did I crash some private party? I talked to our taxi driver the next day and he said the place was a unique bar. 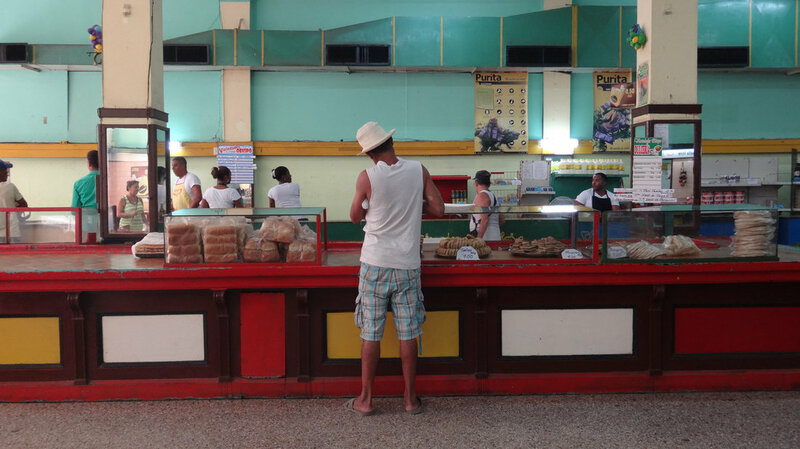 On our second full day in Cuba, Pete and I headed south to Cienfuegos and Trinidad. We ate dinner that night at a really fancy palador called Los Narajos. 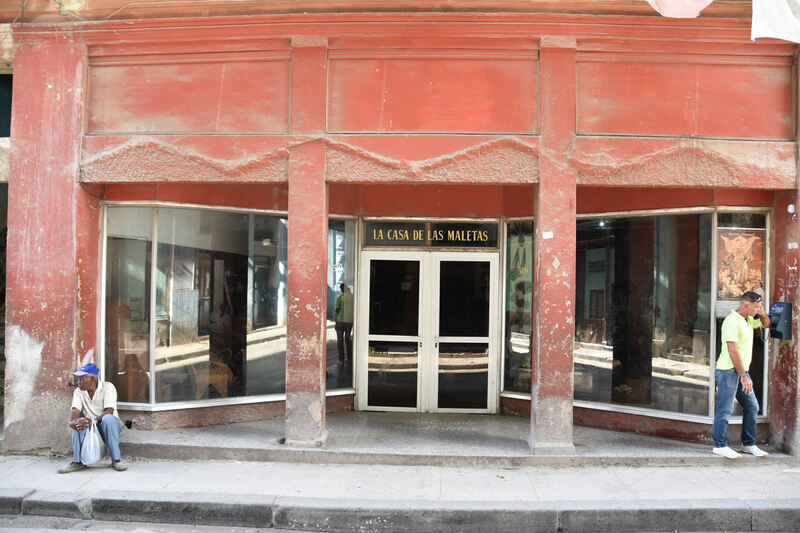 Just like El Cocinero and Fabrica del Arte this place wasn't just awesome in Havana, it'd be awesome anywhere. Woody Allen's film Midnight in Paris reminisces about 1920s Paris when all the city was having a moment like none other. Young artists and writers flocked to the city and simply lived in the moment. 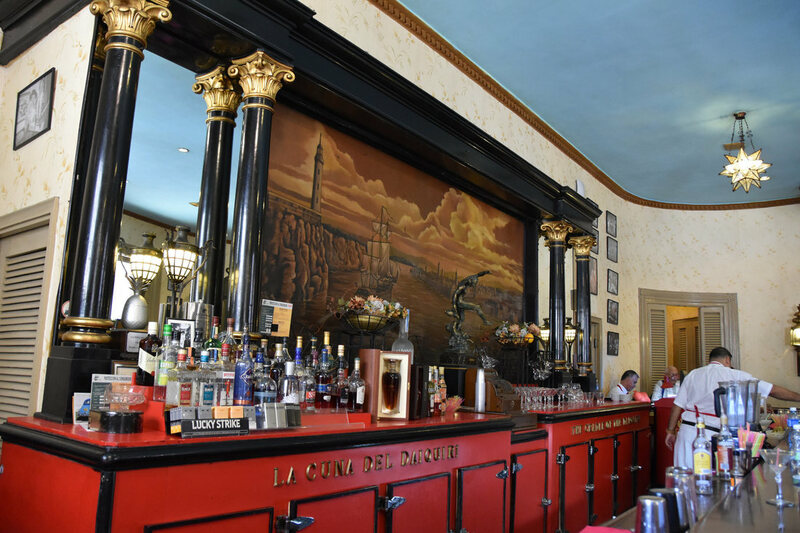 When you are in Cuba, when you are dining in one of these fancy paladors, you simply feel like you are in the moment. That you are dining in this avant-garde type of experience that will only temporarily exist. The food was a little rich but it just doesn't matter. The experience is so unique. Again, the only thing missing are the Cubans and I hope that they are able to experience nights and meals like this. 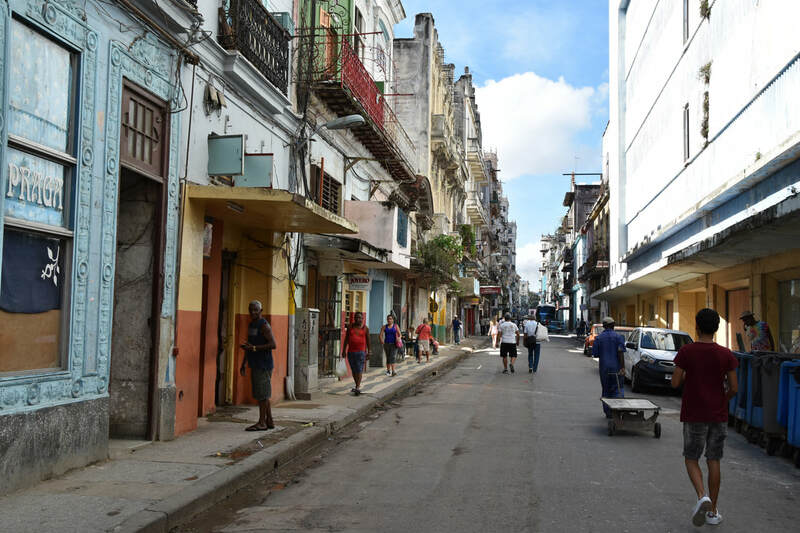 It was our last day in Cuba and I still had not gone around Vedado to take many photos of our surrounding neighborhood. We lucked out with our Airbnb in that there was an American student, coincidentally from Penn State, staying for three months who was able to answer a lot of our Cuba questions. He explained that the lack of restaurants, clothing stores, etc. was that most of these business were hidden away on the ground floor of homes. 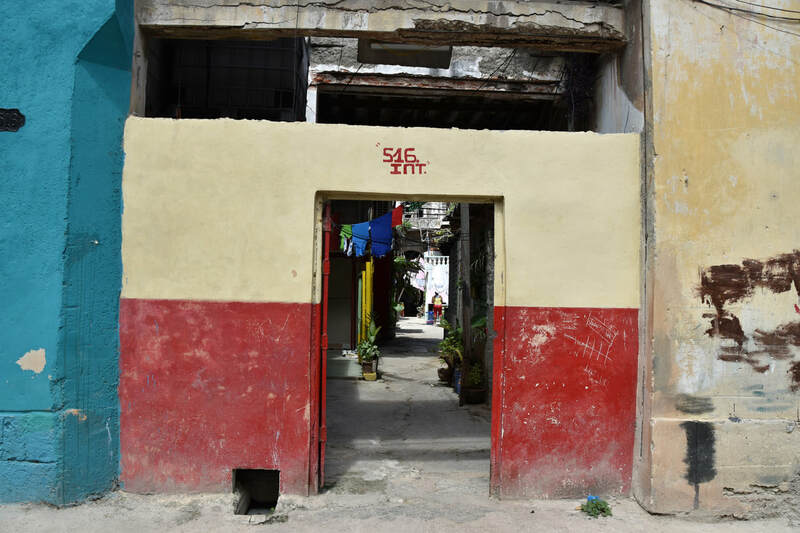 Government restrictions mean people only operate their business a few hours a day or within their homes to escape the watchful eye of the communists. Where do people get a coffee - out of someone's house. 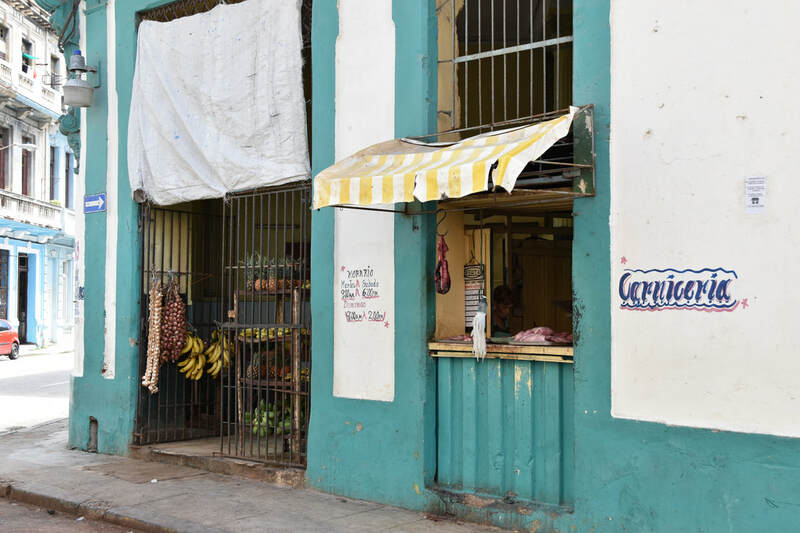 As I walked around Vedado I had a more watchful eye and sure enough I saw several small breakfast stands offering a few items and coffee. Besides these few signs of life the neighborhood was quiet. I made my way up to the Malecon and over to the U.S. Embassy. 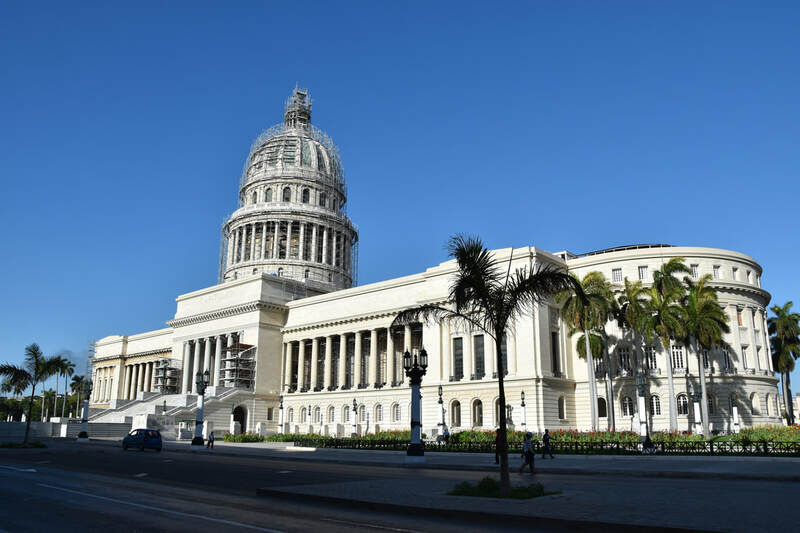 For not being in Cuba for fifty years, the U.S. Embassy has an amazing location in the heart of Vedado right on the waterfont. Sound blast issues aside it's quite the place. 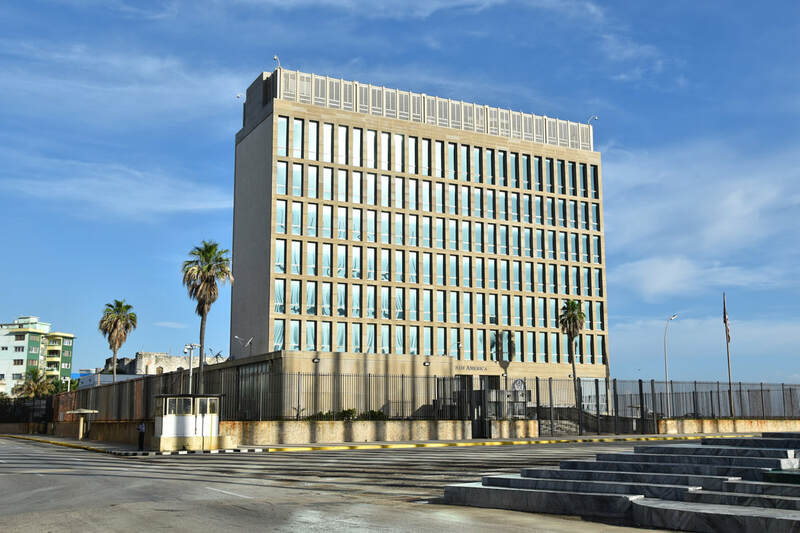 I have no idea how or why the U.S. was able to score this location but it is by far the best situated embassy in the country. 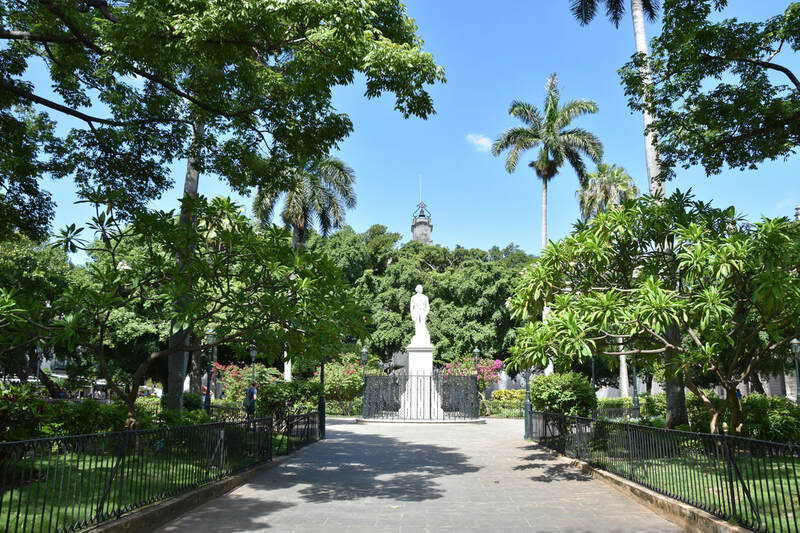 Right across the street from the U.S. Embassy is the Jose Marti Anti-Imperialism monument. The monument is nothing more than a series of metalic spikes, the art equivalent of a middle finger. 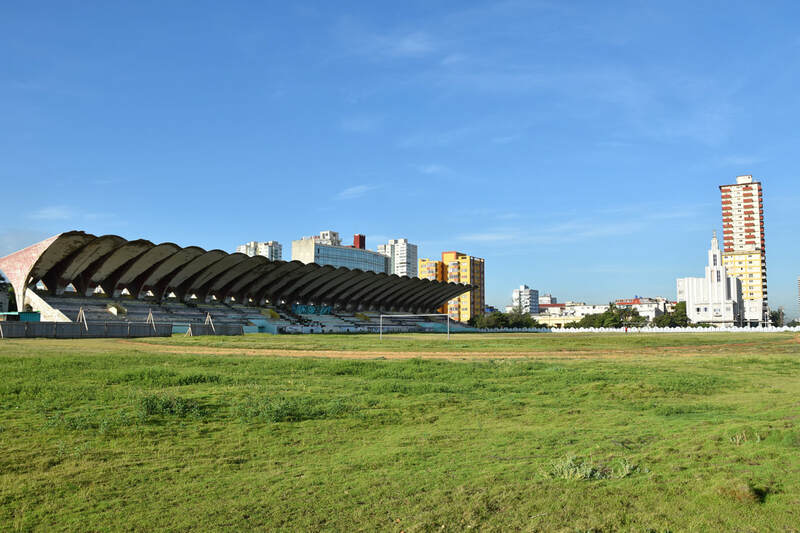 Near the U.S. Embassy was a small park and soccer stadium. Great location, no development. No action. 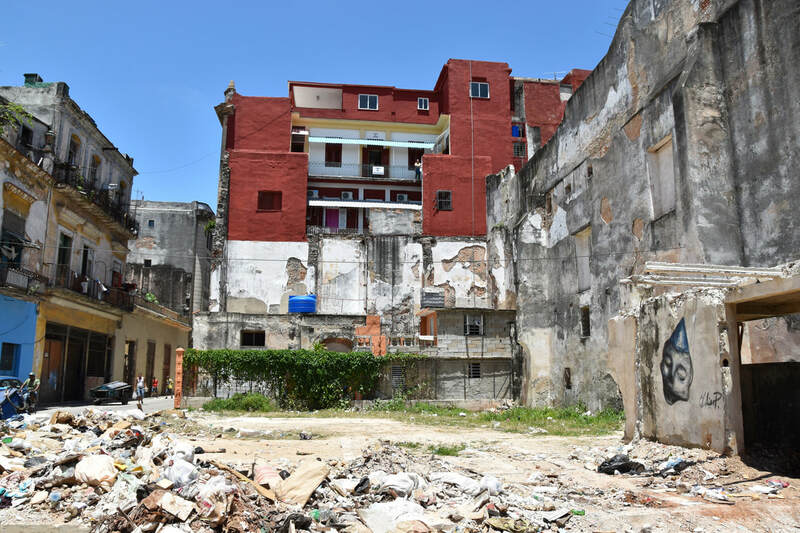 Proof that since Fidel took over, nothing in the form of development has taken place in Cuba. Great parcels of land. Great potential for public space. All going to waste. Come on communists, show how the people can come together and create great spaces for citizens to enjoy. 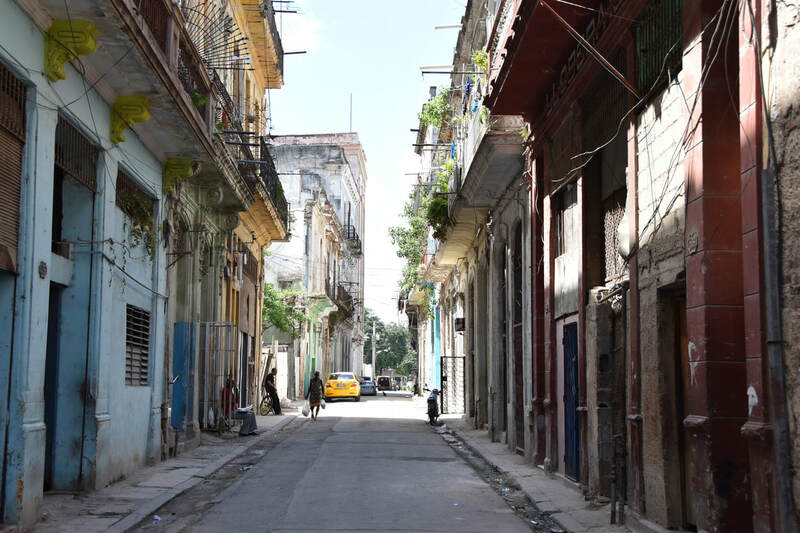 Once Pete was up and we had our bags packed we headed to the Central Havana area. 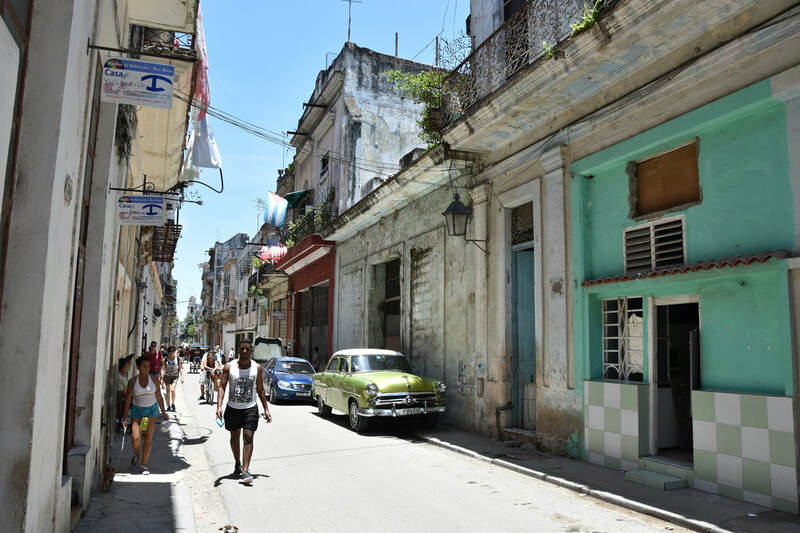 Central Havana sits between Vedado and Old Havana in both a literally and figurative sense. 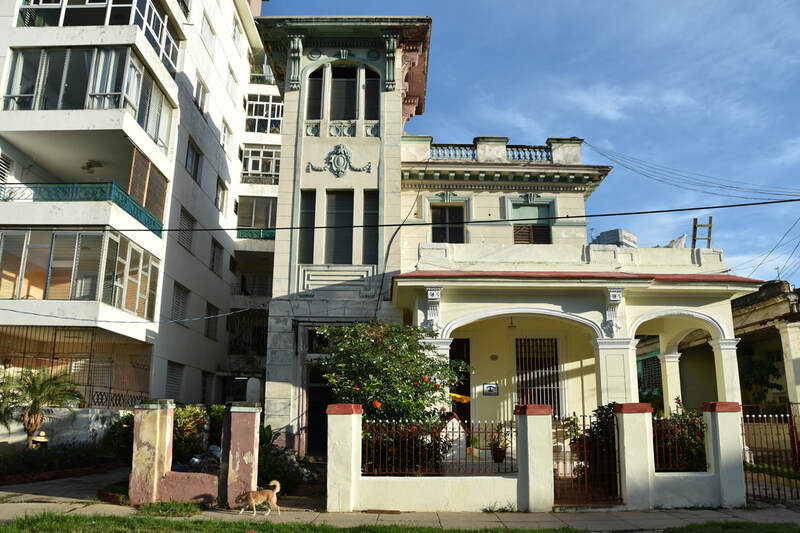 Figuratively speaking the area isn't as poor and run down as Old Havana but doesn't have the grand homes of Vedado. 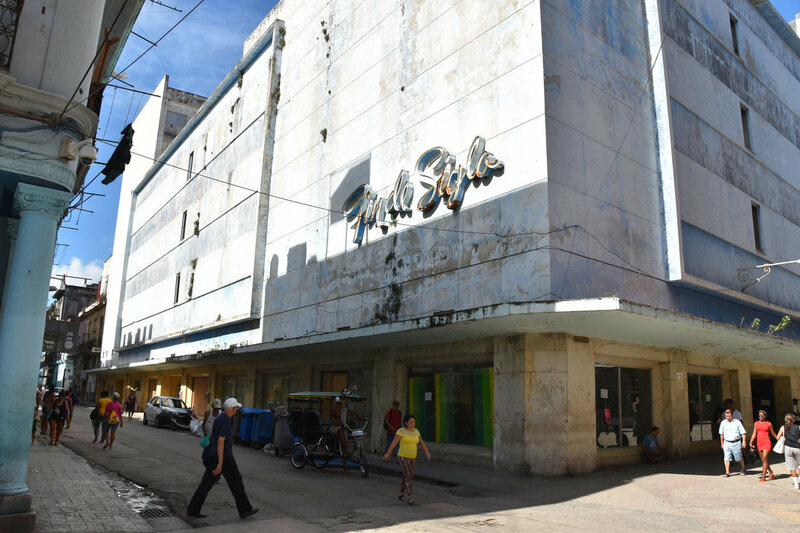 There is more shopping, including a central pedestrian street and apartment style buildings that rise about five stories into the air. 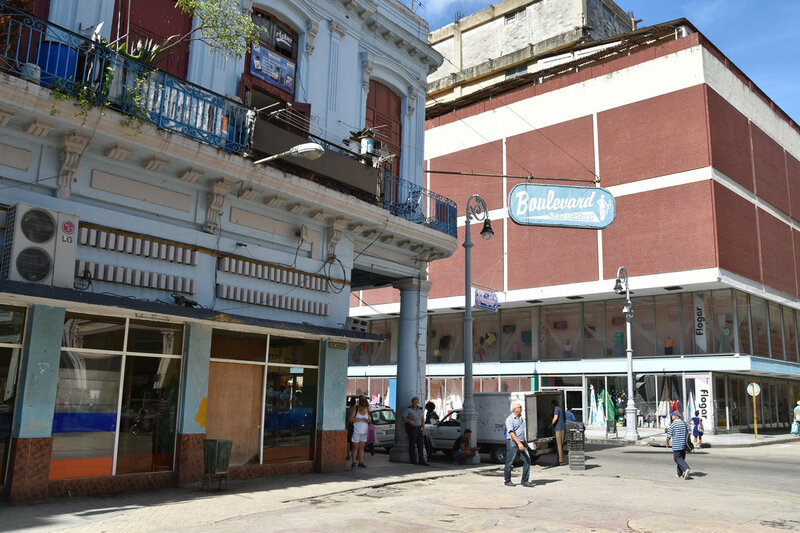 This seemed to be the area that Havanans came to shop and conduct their business. 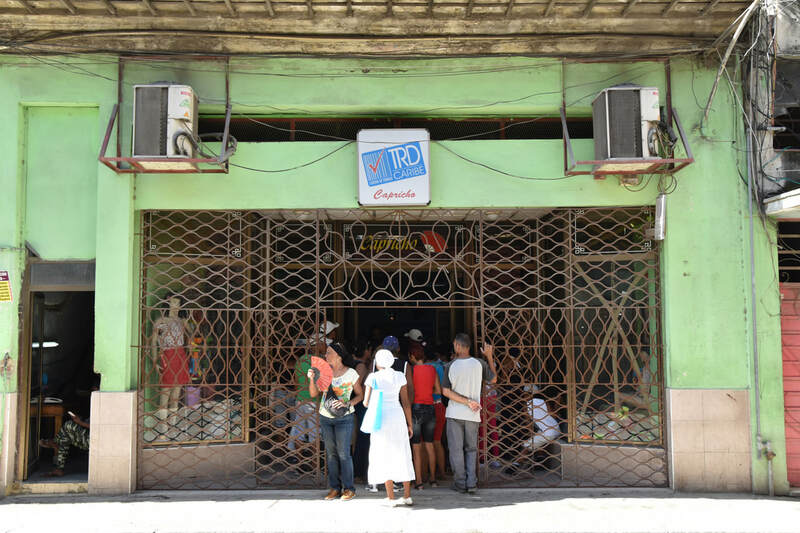 There was much more activity here than what we saw in either Old Havana and Vedado. 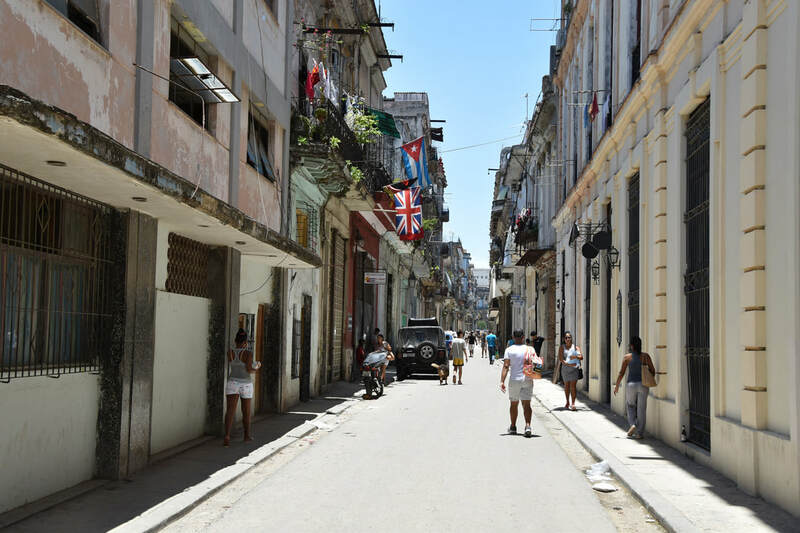 I really enjoyed seeing this side of Havana and wish we had a bit more time to spend here before heading back to the U.S. 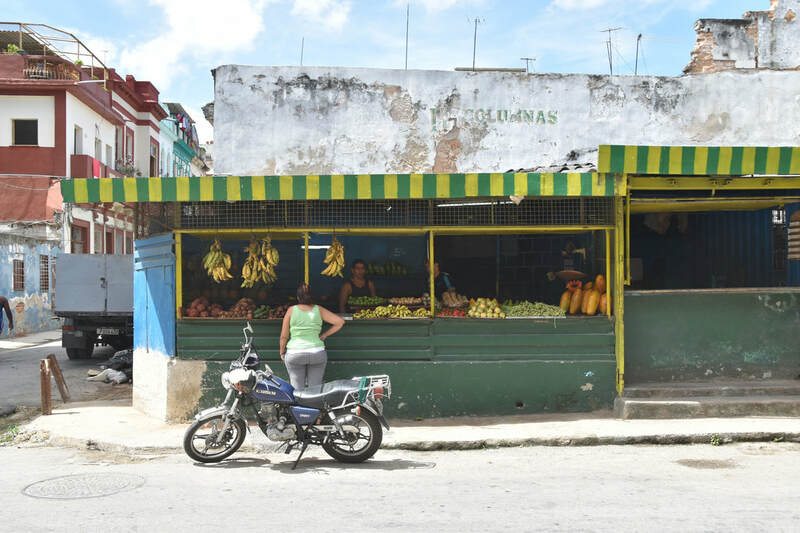 I felt like this was the start of finding the non-tourist zones of Havana. 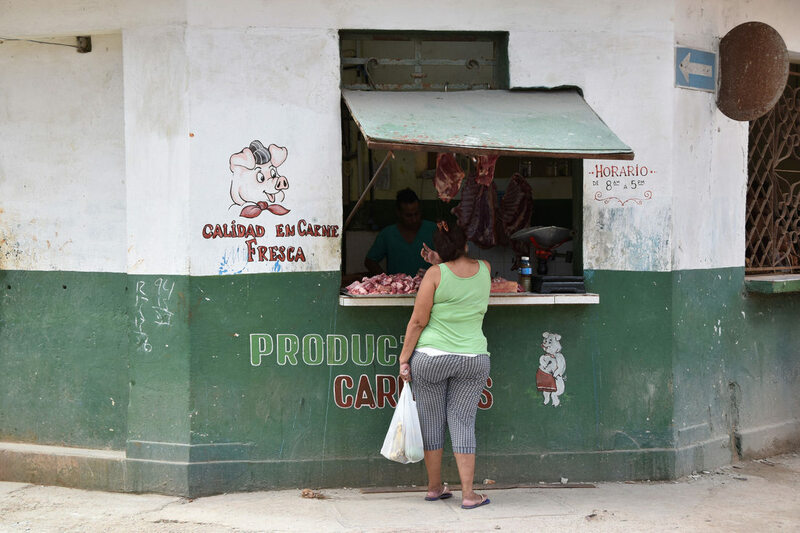 There were basic storefronts offering meat and fruits. There were people out buying things, relaxing, and enjoy the day. 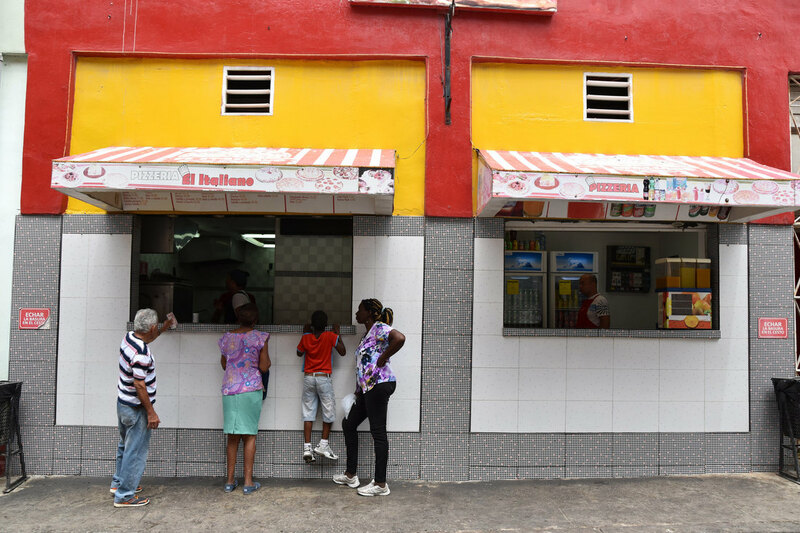 We came across a pizza stand and couldn't fight the urge to try a Cuban pizza. Let me say that they are very loose with the term pizza, in the way they are loose with the term Cubano sandwich, but I kid you not, the pizza was pretty good. The crust reminded me of a soft bread, the sauce was a bit runny, the cheese almost non-existent, but it worked. 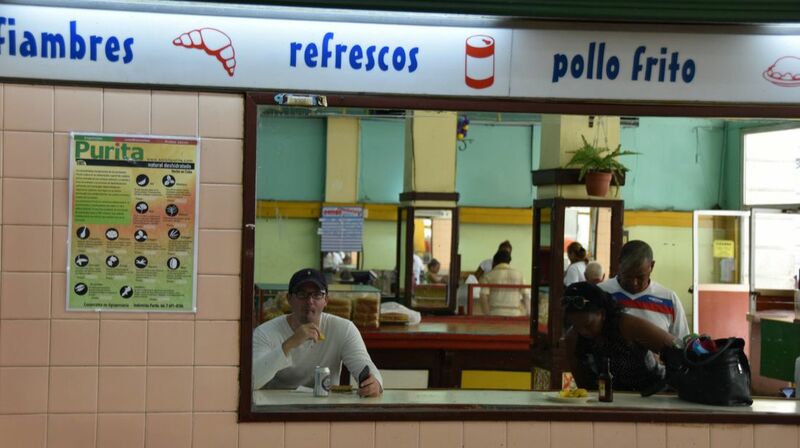 Hands down best meal for the price in Havana. For our final meal we headed west along the coast to Miramar. 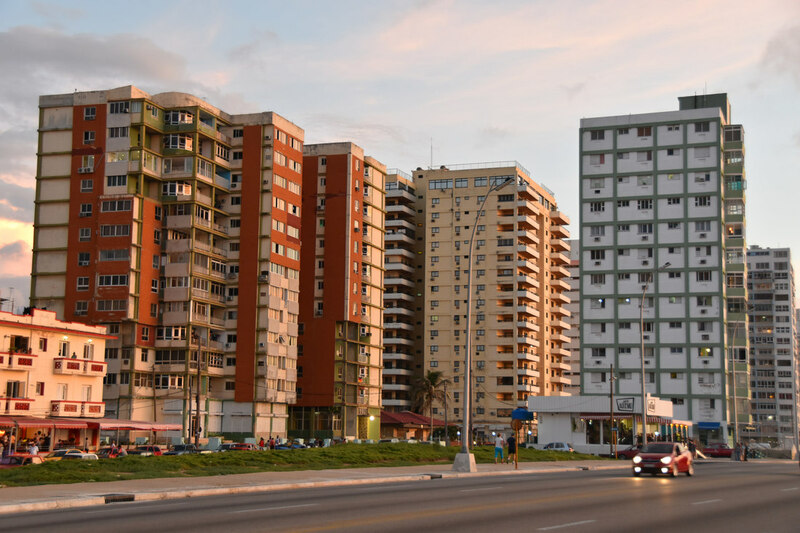 Miramar has a concentration of embassies and resorts so I was expecting it to be a more upscale neighborhood, even more so than Vedado. The expectation turned out the be correct. 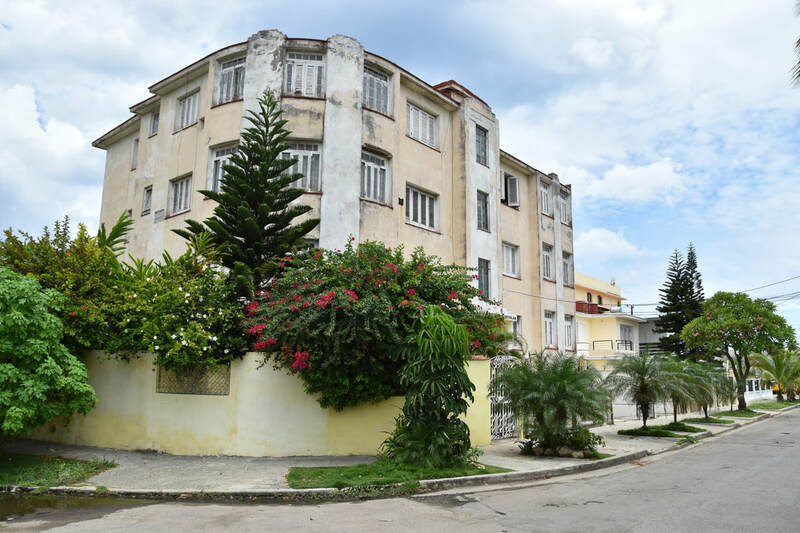 While many of the homes did not have the opulence of Vedado, they did appear to be newer, nicer, and overall in better shape. 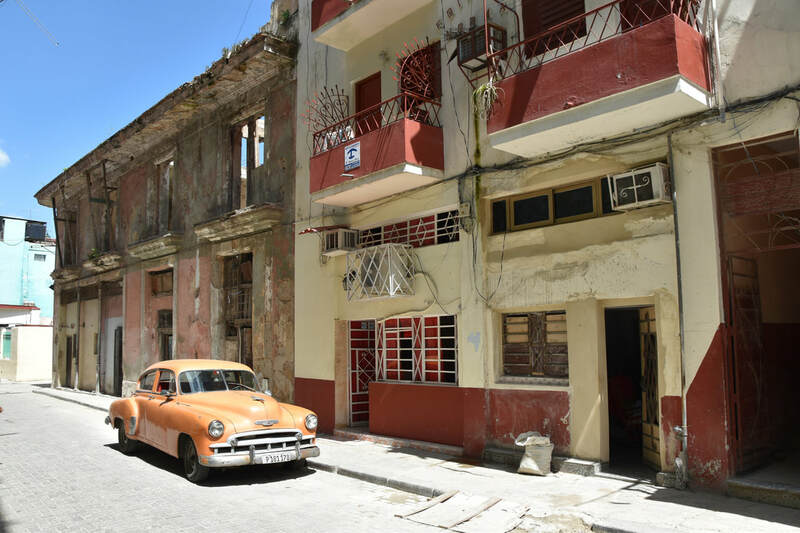 There are also more new cars in this area since the embassies do not need to abide by the same laws on car imports as Cubans. 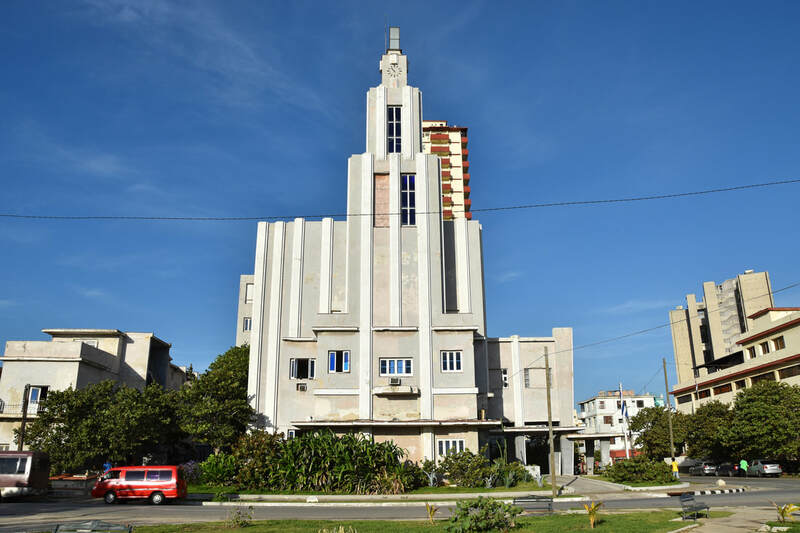 There are no real "tourist" destinations in Miramar so we took a cab to the Hotel Copacabana, hoping that it was the hottest spot in Havana. It was decent. The lobby was decent. The pool was decent. Nothing too fancy or over the top. Certainly not a Hotel Nacional on the beach. 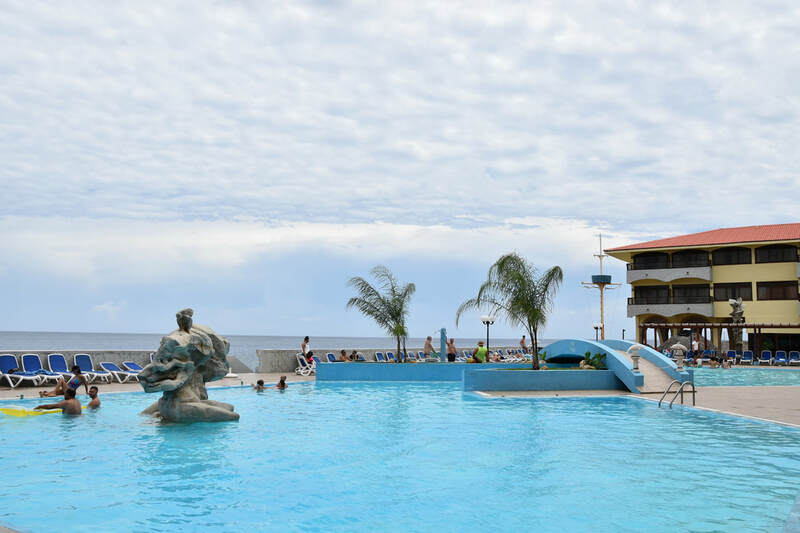 The pool was busy with Europeans escaping the Havana midday heat. From here we walked to Paladar Vistamar which was the most house-like yet of the Paladar's we have been to. A great last meal in a very fancy and modern house. If there's an issue with Miramar, it's that the cabs are few and far between. 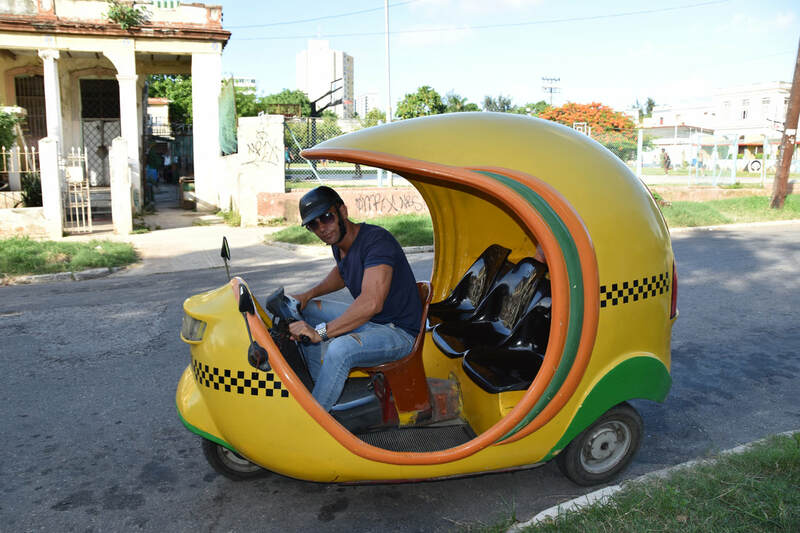 Then, when they showup, the driver knows your not the budget traveller and it's impossible to negotiate a fair fare back to Vedado or Old Havana. We wound up paying nearly twice as much for our return trip as we did on our way to Miraramar. We utilized our cab driver one more time for a ride back to the airport. I was a bit nervous about ticketing and checking in at the airport. 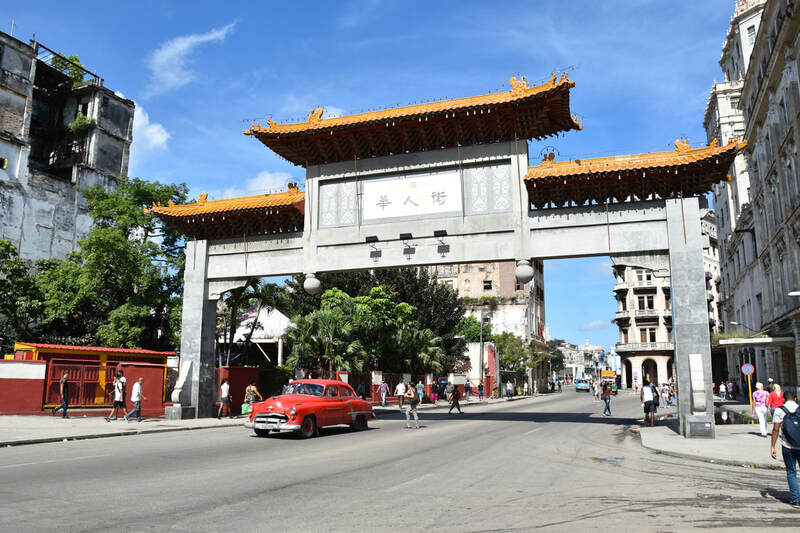 Everything to date had gone smoothly, no "only in a communist country" mishaps, no issues with our visas or lack of travel documents, no issues with the timing of the flights. Something had to go wrong. I was worried for nothing. We checked in, passed through security, and then started buying El Presidente beers with our remaining Cuban currency. One final hurdle. Entering the US. I walked up to immigration. One question - business or pleasure? Pleasure. And I was back on US soil.